Book Lots 351-400 - Mike Clum Auctions Inc.
351. 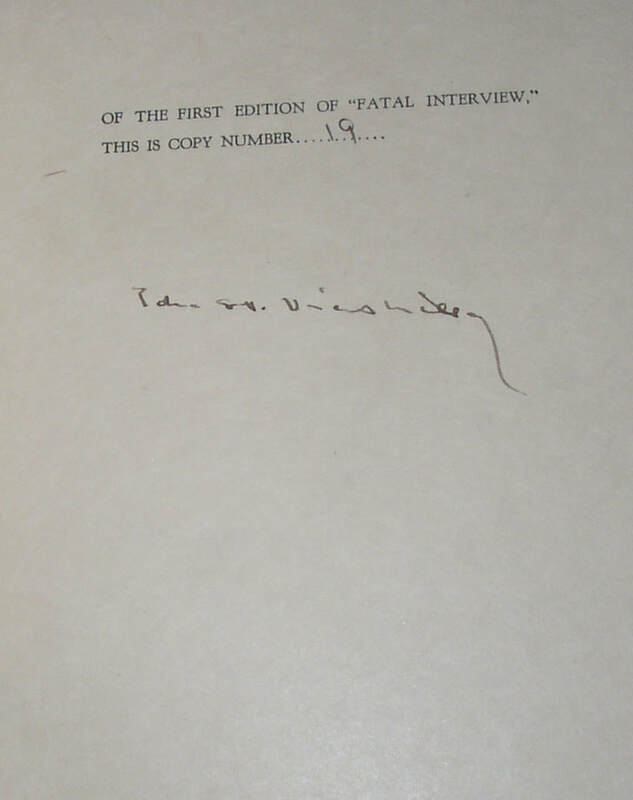 Edna St Vincent Millay, Fatal Interview, scarce signed limited 1st edition on vellum, 1 of 30. New York: Harpers, 1931. Signed and limited first edition, one of 30 copies on Japan vellum; this one is number 19, and it remains in the original spider-web glassine jacket and in original slipcase (also numbered 19). A superior copy, all around. Condition: Minor chipping to the edges of the jacket; otherwise all parts near Fine. 352. 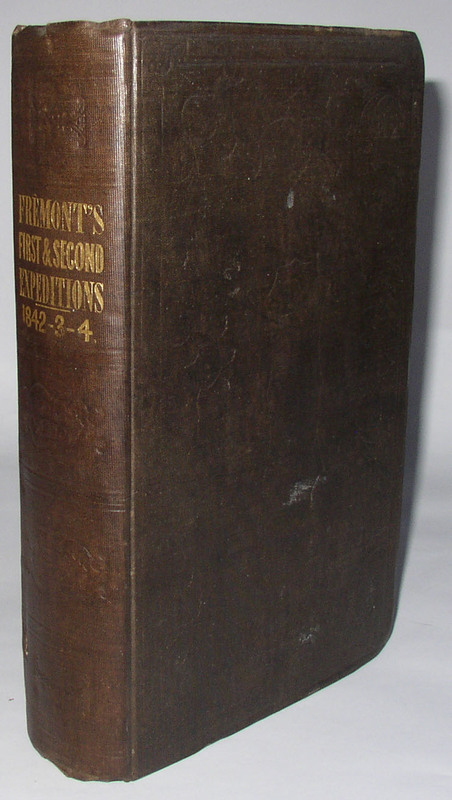 John C Fremont, Report on the Exploring Expedition to the Rocky Mountains, 1842. Senate Edition, complete with all maps. Washington DC: Gales and Seaton, Printers, 1845. The Senate edition, with an extra hundred pages of astronomical data, is usually preferred. This copy is an exceptional copy, for being in the original cloth binding and for being entirely complete, including both folding maps bound and including the very large folding map placed in the rear pocket. This last map looks to me like it has very rarely been opened, and it, too, is in exceptional condition. A very nice example of this scarce and important book of Western American exploration, and with a map that is important in its own right. Condition: Near Fine: outer corners of the board with bumps/turn-in, with one including a split to the cloth. Some internal foxing. But the original cloth binding is very solid and attractive. Large map folded, of course, but without tears or loss: outstanding. Wonderful condition. 353. 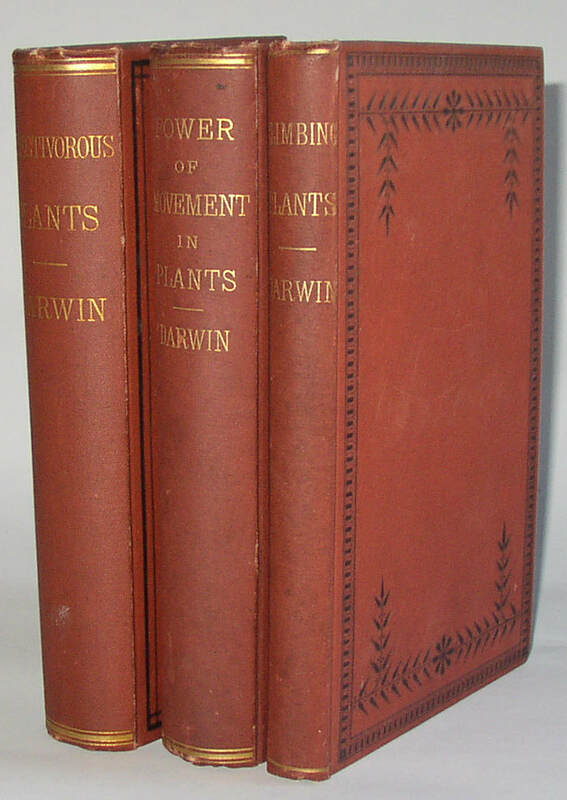 Charles Darwin, 3 US 1st Editions, 1875-1881: Carnivorous Plants, Movement in Plants, Climbing Plants. New York: Appleton, 1875-1881. Three handsome matching volumes from late in Darwin’s career, each a collectible US first edition, with the correct dates on the title pages. Very nice to find these books together. Condition: About VG, with minor wear at spine ends and minor surface soil to the exterior. Some external foxing; no writing or ownership markings. 354. 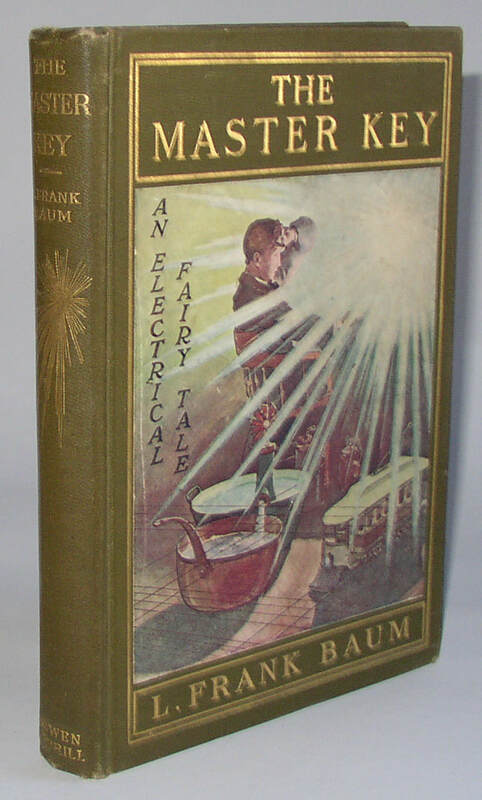 Two scarce early L Frank Baum books, The Master Key, and Life of Santa Claus. The Master Key is, I believe, a first edition, first printing. 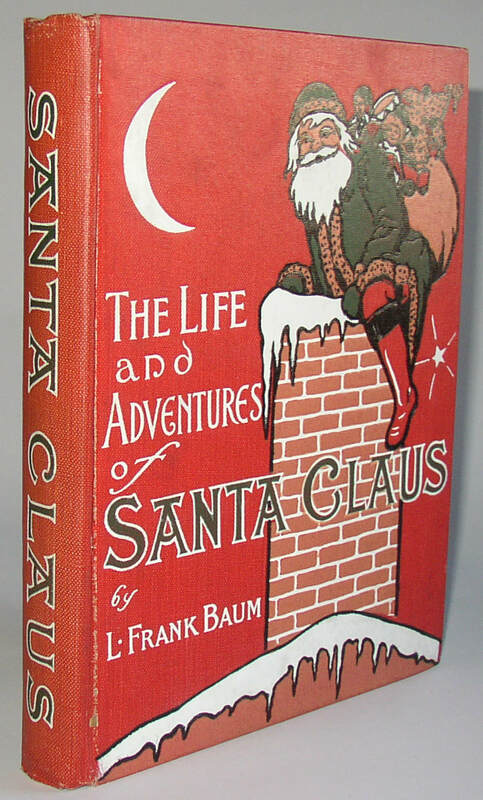 The Life and Adventures of Santa Claus is published by Donnelly, rather than Bowen-Merrill, so it is an early copy, but not first edition. 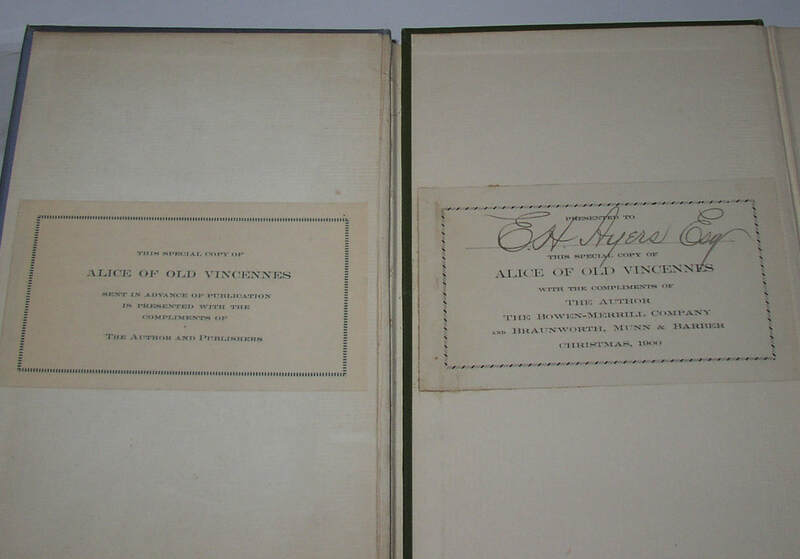 Condition: Both books about VG or VG plus, with some external wear, but without internal writing or ink (some pencil marks in Key). Personae (London: Elkin Matthews, 1909); Provença (Boston: Small Maynard, 1910). 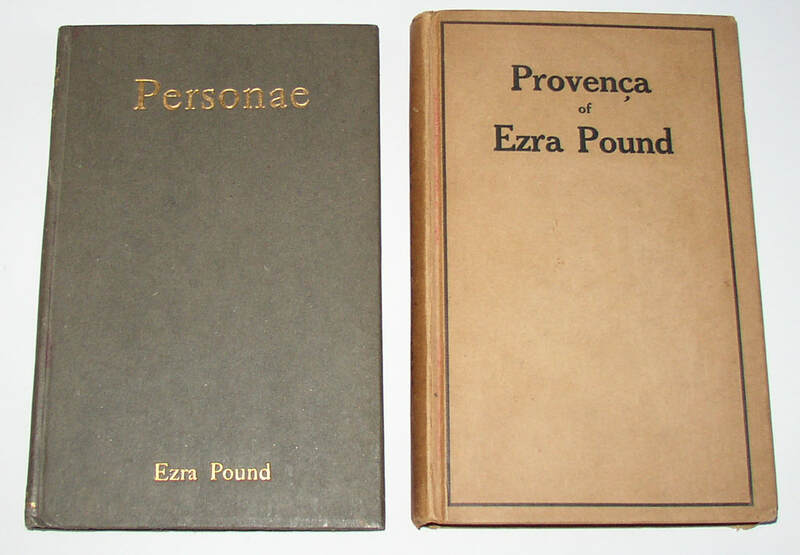 Two very early first editions from Pound. Condition: Personae is Near Fine; Provença has one corner bumped/split, but the spine is in better shape than often seen. There is a droplet spot on the rear board. Former owner’s name and date (1912) on front free end-paper. 356. 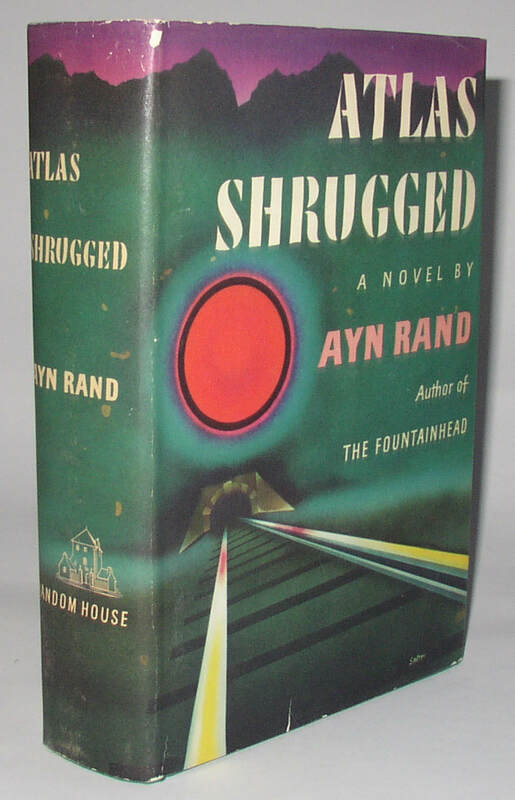 Ayn Rand, Atlas Shrugged, 1st edition, ninth printing. New York: Random House, 1957. Ninth printing stated. Dust jacket has $6.95 price present and the 10/57 date code at bottom of front flap. Still surprisingly scarce and collectible. Condition: book is VG to Near Fine. Jacket has a couple small flaws (a surface flaw at the top joint between spine and front panel and a couple of droplet spots on spine. There are a couple short closed tears. 357. Two scarce nineteenth-century books on whaling, incl. The Whale and his Captors (1849). 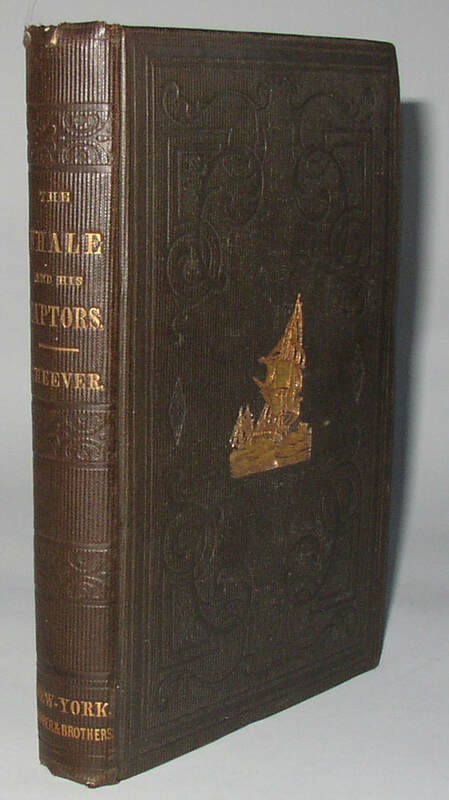 Includes: Cheever, The Whale and His Captors (New-York: Harper, 1849), first edition; and Bullen, The Cruise of the Cachalot (London: Smith, Elder, 1898), first edition. Two very collectible titles. Condition: Cruise is very nearly Fine, with some very mild bumps at spine ends. The Whale and his Captors is Very Good, with a bit of chipping at the top of the spine, some internal foxing, and a corner-damps-stain affecting a number of pages, but not too distressingly. 358. 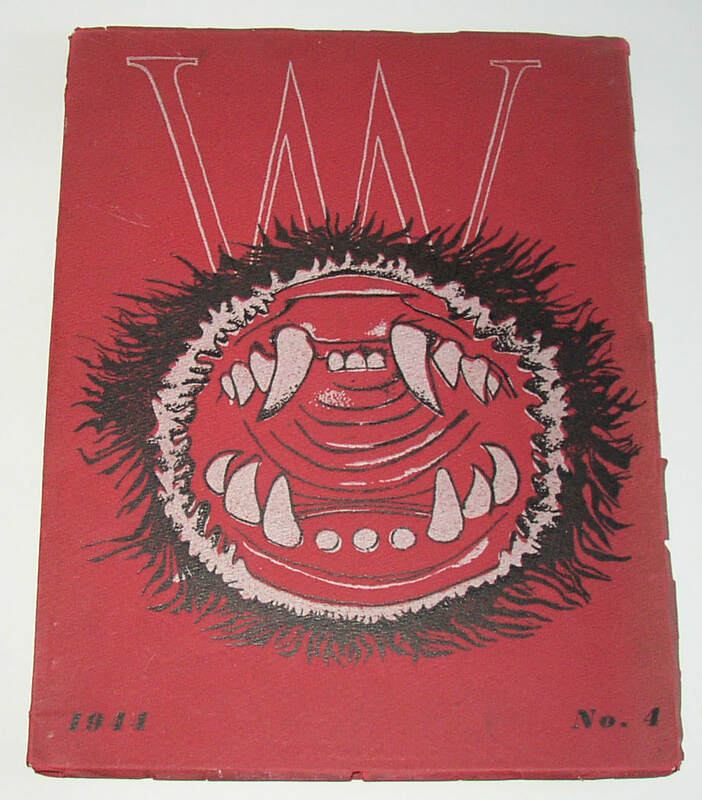 Rare Surrealist magazine, VVV, number 4, 1944. New York, 1944. This scarce and collectible Surrealist publication, edited by David Hare, had Max Ernst and Marcel Duchamp on its editorial board; it is notably scarce on the market today. Includes a variety articles as well as works of visual art. A super item. Condition: VG condition; minor wear at the edges. 359. J D Salinger’s 1st book appearance, in The Kit Book (1942); plus two other items. Chicago: Consolidated Book Publishers, 1942. Edited by R M Barrows. First edition, with 1942 date on copyright page. Salinger’s story, “The Hang of It,” marks his first appearance in a book. Also: another copy of The Kit Book, with the date of 1943 on the copyright page. 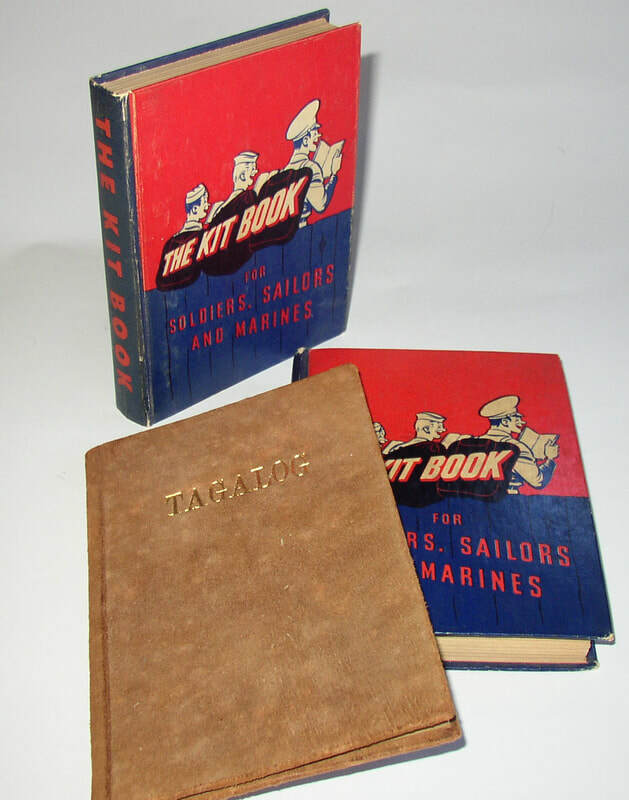 And Tagalog (1944); US military guide to this key language of the Philipines; this is a special, perhaps unique copy, bound in suede leather boards. Condtion: Both copies of The Kit Book with some wear to the edges. The 1942 copy with an ink name on the inside. The suede of the cover of the Tagalog book is shedding. 360. F Scott Fitzgerald, Tender is the Night, original serial appearance in Scribner’s Magazine (1934). 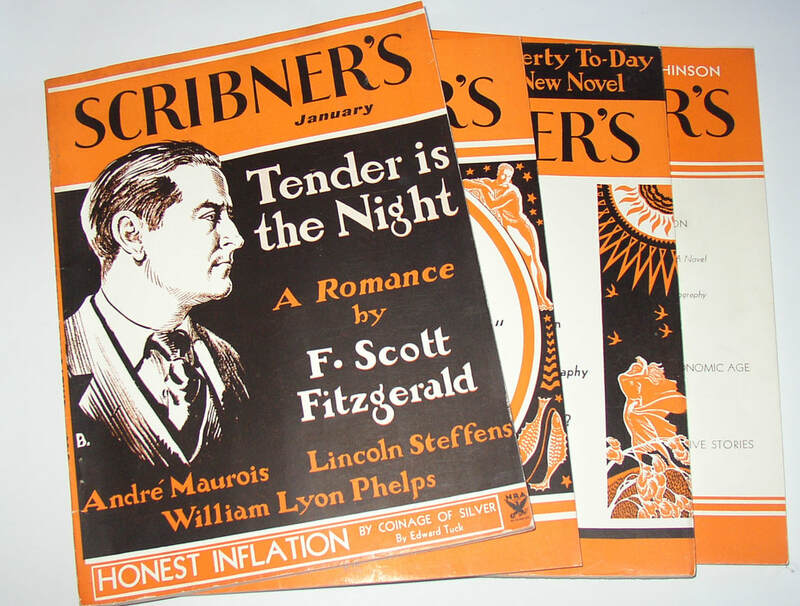 Four issues of Scribner’s magazine, making up the original publication of Fitzgerald’s Tender is the Night, as well as including other material. Beautiful copies of this scarce periodical. Condition: mild wear on the edges of the spine: Very Good plus, I think. 361. 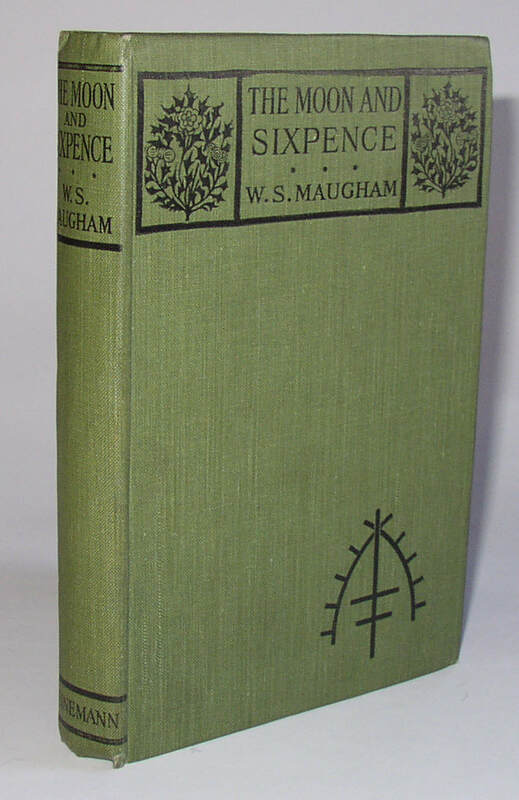 W. Somerset Maugham, The Moon and Sixpence, UK 1st edition. London: Heinemann, 1919. 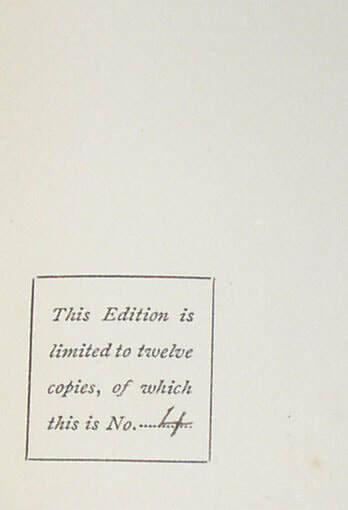 First edition, probable second state, with the two leaves of ads at the end excised, leaving short but visible stubs. One of Maugham’s greatest books, but lacking the very scarce dust jacket. 362. 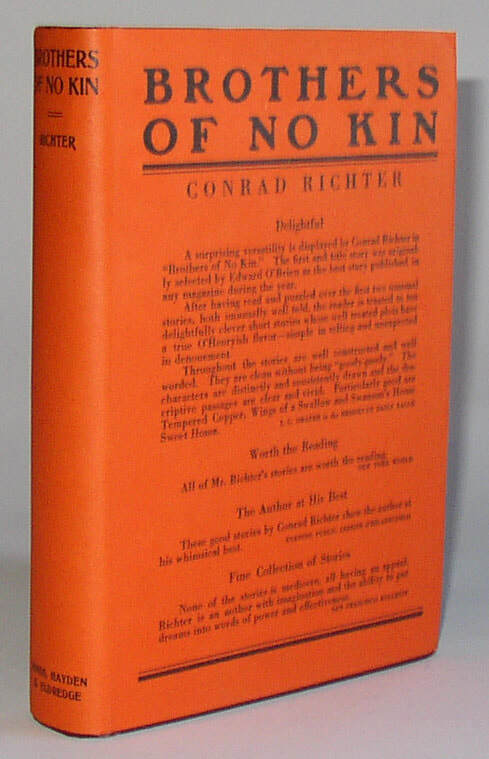 Conrad Richter, Brothers of No Kin, signed 1st edition in dust jacket. New York: Hinds, Hayden & Eldredge, 1924. 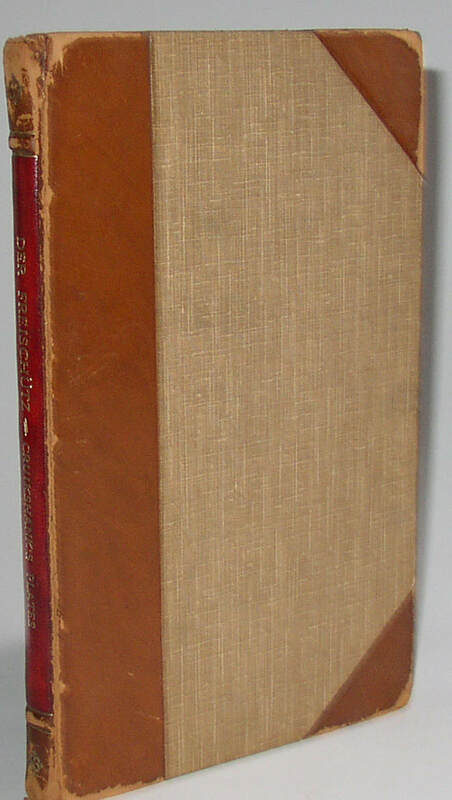 Richter’s first book, scarce in this condition. Signed with a brief inscription on the front free end-paper by Richter. Condition: Book is Near Fine, with a small bookstore label to rear paste-down; minor spotting to the page edges as from a smoker’s household, though without a noticeable scent. Dust jacket (orange, with reviews) is probably the second state, but it is Fine in condition. 363. 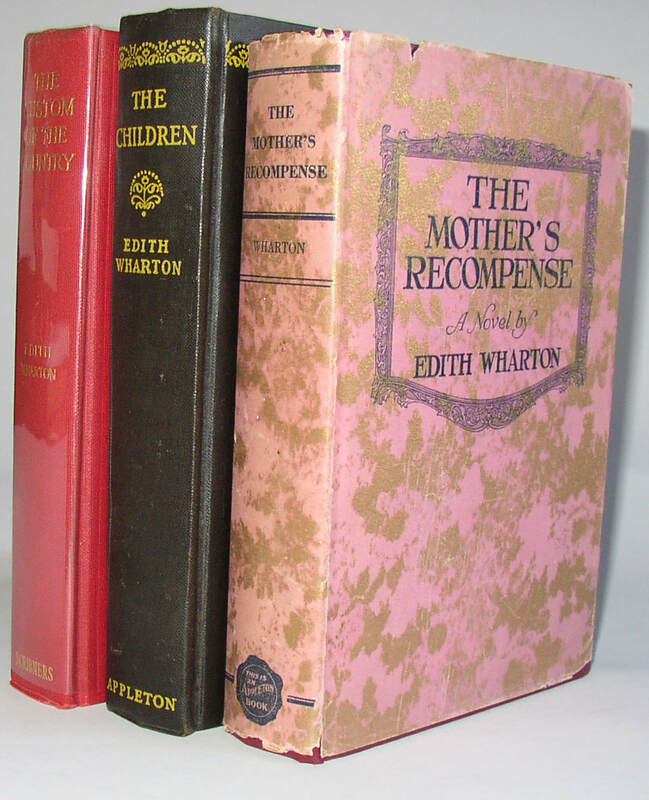 Three Edith Wharton 1st editions, The Mother’s Recompense in original dust jacket. Includes: The Mother’s Recompense (Appleton, 1925) in original dust jacket (with numeral 1 on last text page). Also The Children (Appleton, 1928): “I” on last text page, no “First printing” slug on copyright page. Also, The Custom of the Country (Scribner’s, 1913). Condition: Mother’s Recompense: near VG/VG, with some wear and chipping to the jacket. Children, near VG. Custom, near Fine, but with the title page affected by a corner tear when opened, leaving the corner attached to the following leaf. 364. 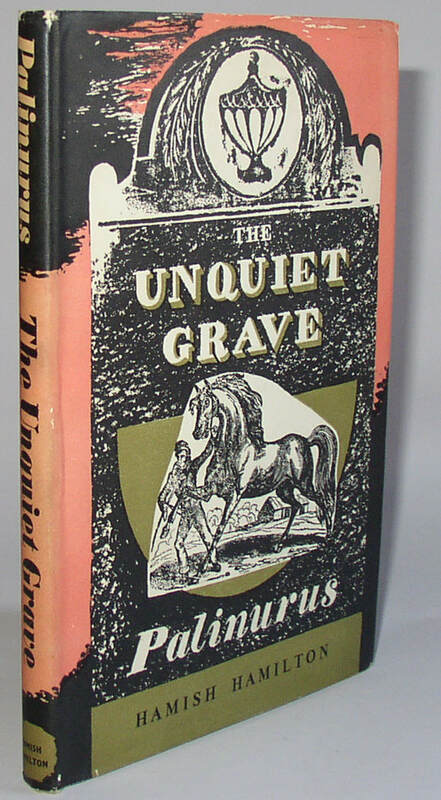 Cyril Connolly/Palinurus, The Unquiet Grave, 1st revised/book edition, inscribed by author. London: Hamish Hamilton, 1945. 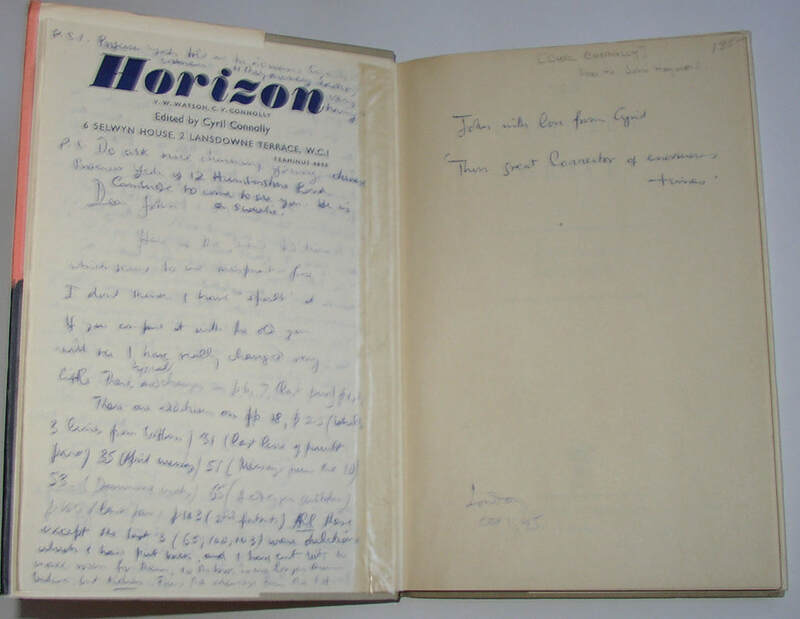 As the copyright page notes, the text was first published in Horizon in 1944. 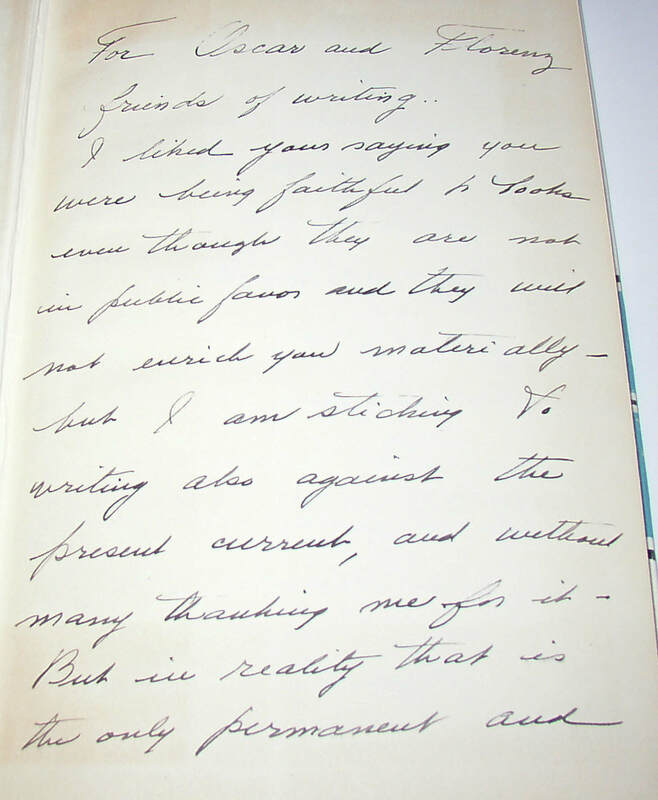 Inscribed by the author to John [Hayward] and with a super two-page handwritten letter to Hayward tipped onto the front board (written on Horizon stationery) and detailing the alterations made. Hayward is described in the book’s inscription as “Thou great corrector of enormous times” and apparently, many of the alterations had in fact been suggested by Hayward. A very important copy of this book that made quite an impression in its day. Condition: Book has a couple of bumps to the tips of the boards; jacket has some edge-wear. NF/VG or so. Paris: Obelisk Press, 1939. 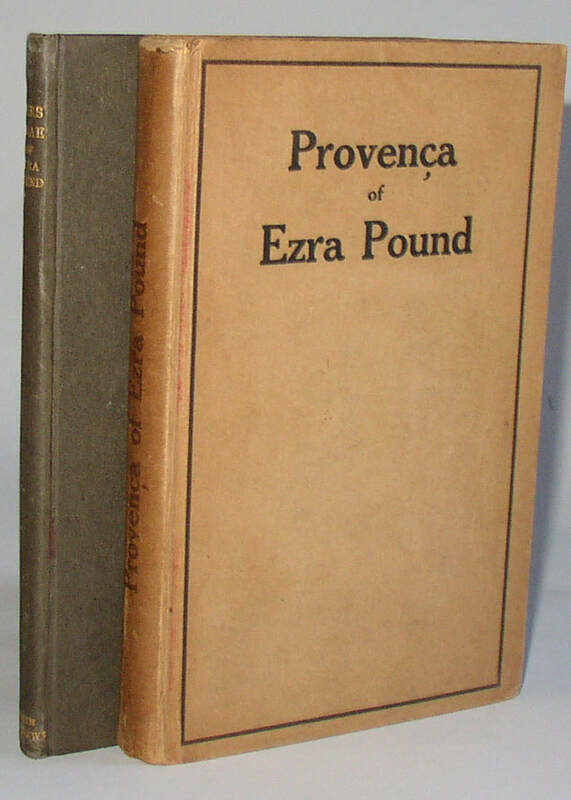 First edition; the 60 francs price on the spine and on the front flap has been inked out (as have some of the prices on the rear flap), so it is a copy the publisher raised the price on (up to 79 francs, it appears from a stamp on the last interior leaf), but it is an extra-clean and fine copy of a book often seen in poor shape. Condition: Very minor bumping to wraps, and some minor surface wear to the white paper of the rear wrap: Near Fine overall. 366. 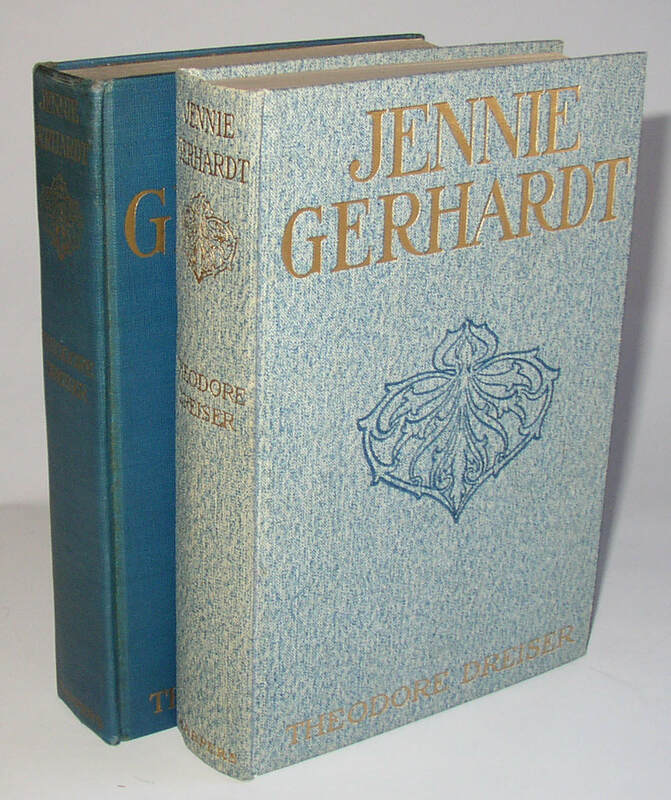 Theodore Dreiser, Jennie Gerhardt, 1st edition, two copies. New York: Harpers, 1911. 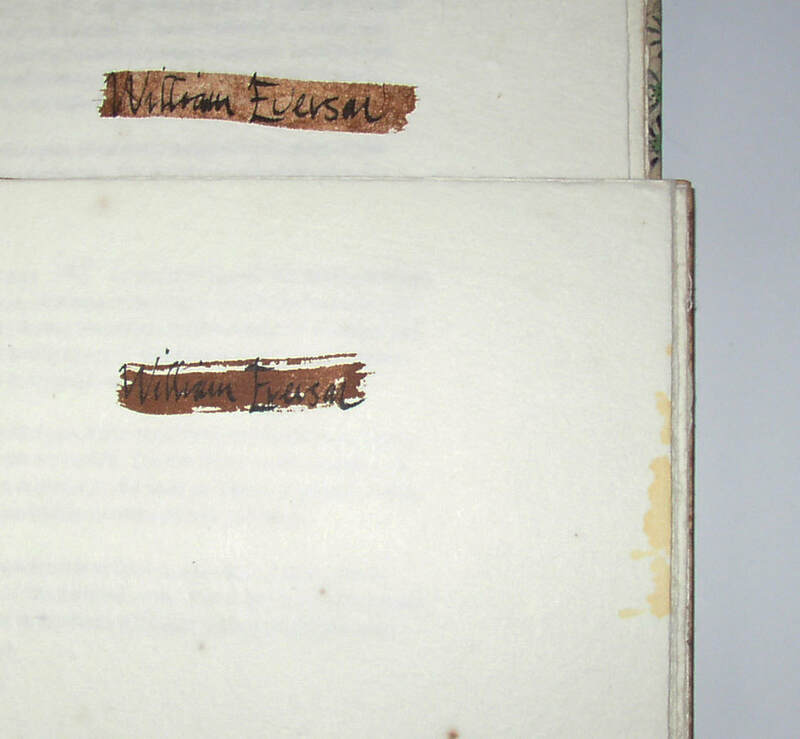 Both copies have the error of “is” for “it” on line 30 of p. 22; both have “Theodore Dreiser” on the spine. One is in the mottled blue cloth, and one is in the darker plain blue cloth. Together these copies would seem to suggest that both types of cloth were used on the first edition, first state copies. A great set. Condition: Both copies in close to Near Fine or Fine condition; the mottled blue cloth copy with an old Brentano’s bookstore label on the rear paste-down. 367. 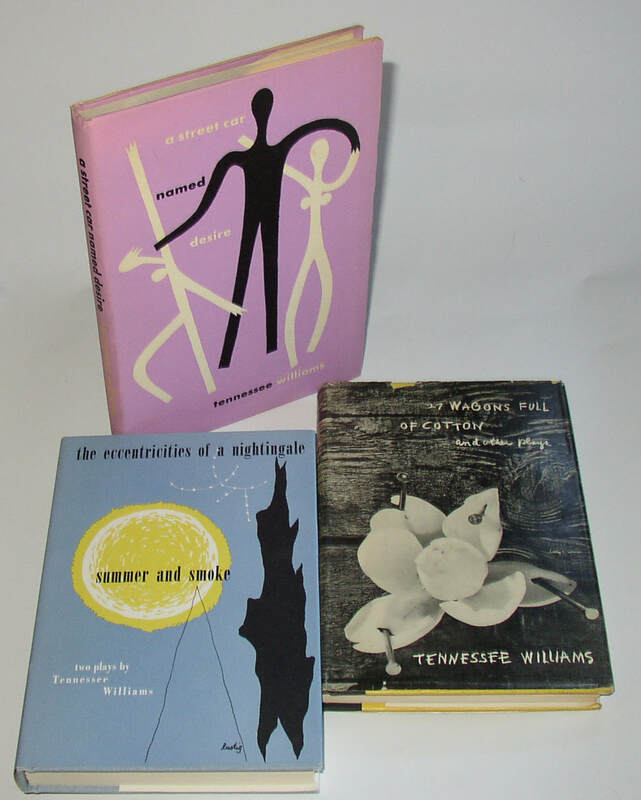 Three Tennessee Williams 1st editions, including A Streetcar Named Desire (1947). Includes: A Streetcar Named Desire (1st edition in dust jacket); The Eccentricities of A Nightingale and Summer Smoke (1st edition in dust jacket) and 27 Wagons Full of Cotton and Other Plays (1st edition, second state with introduction present, in dust jacket). All three are without any explicit indication of later printings. Condition: Streetcar with some waviness to the pages, but from binding, not from moisture, as one can tell on a couple of pages where the waviness extends the full page length); jacket is Near Fine; Eccentricities: F/F as new; 27 Wagons is VG/VG, with previous owner’s name on end-paper and some wear and chipping to the jacket. 368. 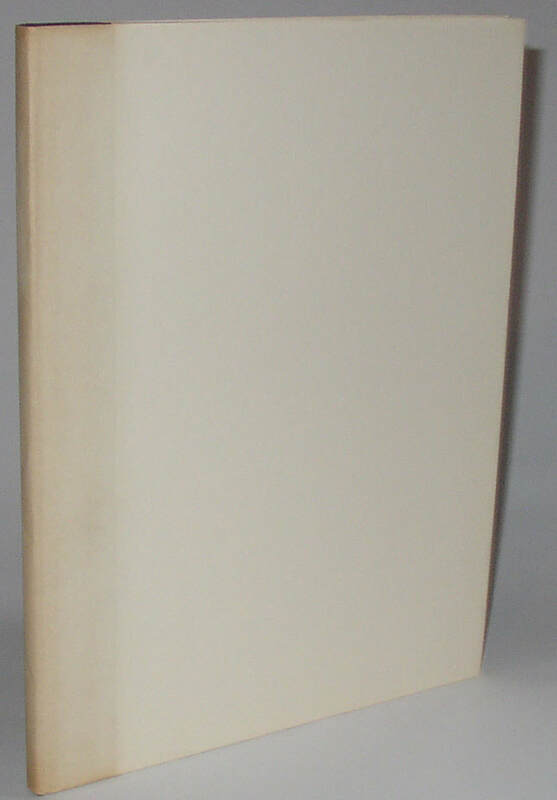 Charles Olson, O’Ryan, Signed hardbound edition of 1965, 1st edition. White Rabbit Press, 1965. An expansion of the 1958 edition. 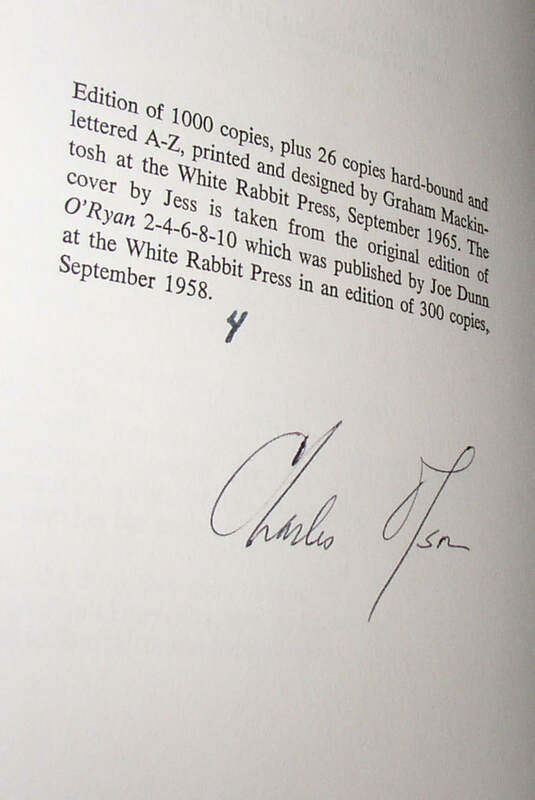 The colophon page states that there were 26 copies “hard-bound and lettered A-Z”; this copy is hardbound, signed by Olson, but it is given a number (4) instead of a letter. Presumably, it is either copy D, numbered instead of lettered by accident, or possibly there was an over-run of hard-bound copies, numbered by Olson beyond the nominal 26; either way, a very scarce book by this important post-War poet. Condition: As new in acetate jacket. 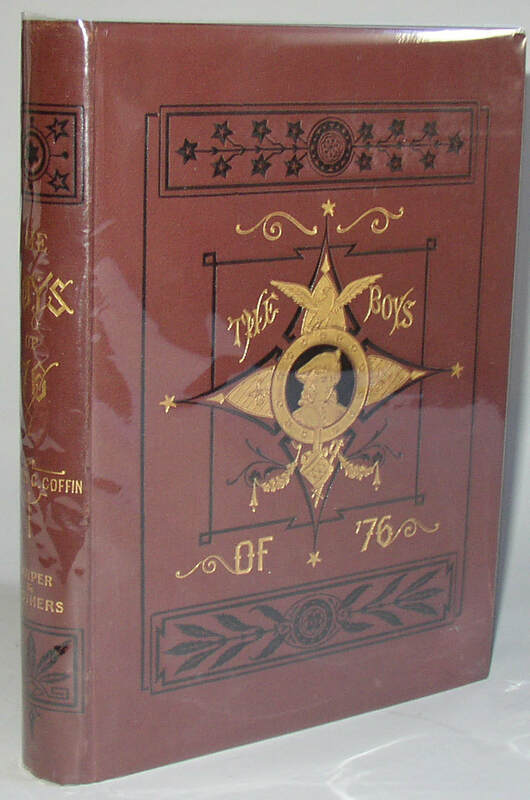 369.Charles Carleton Coffin, The Boys of ’76, inscribed 1st edition. New York: Harper, 1876. 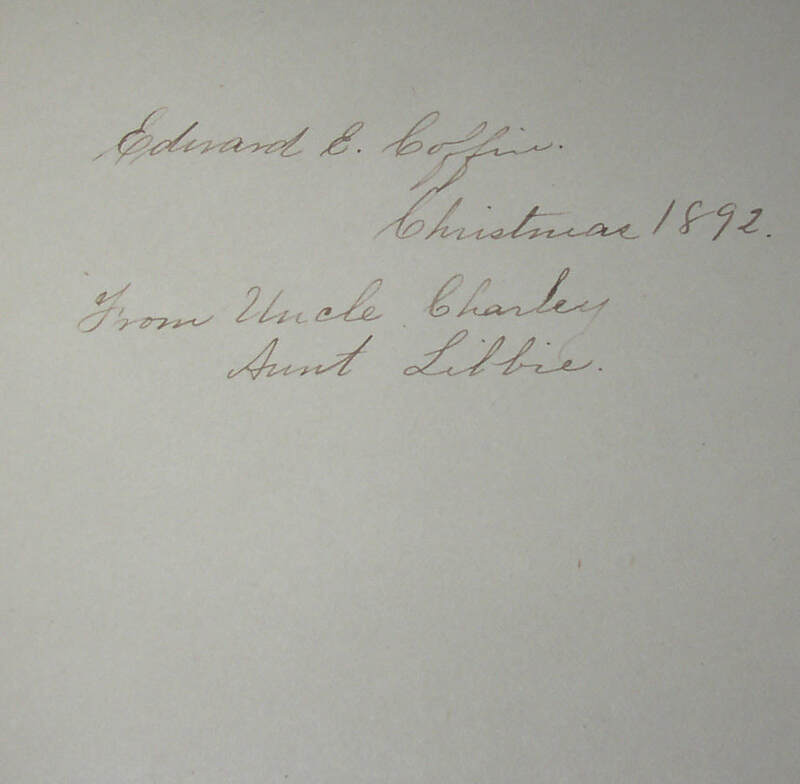 Inscribed on the second front free end-paper, “Edward E. Coffin/ Christmas 1892/ From Uncle Charley/ Aunt Libbie.” Given the name of the recipient and the family relation, this would seem to be an authorial inscription; note, however, that Coffin’s wife’s name was “Sally,” so that the gift is not merely from Coffin and his wife. Condition: A very nearly Fine copy, with mild spine roll. A later owner’s name in ink is also on the same page as the inscription. 370. 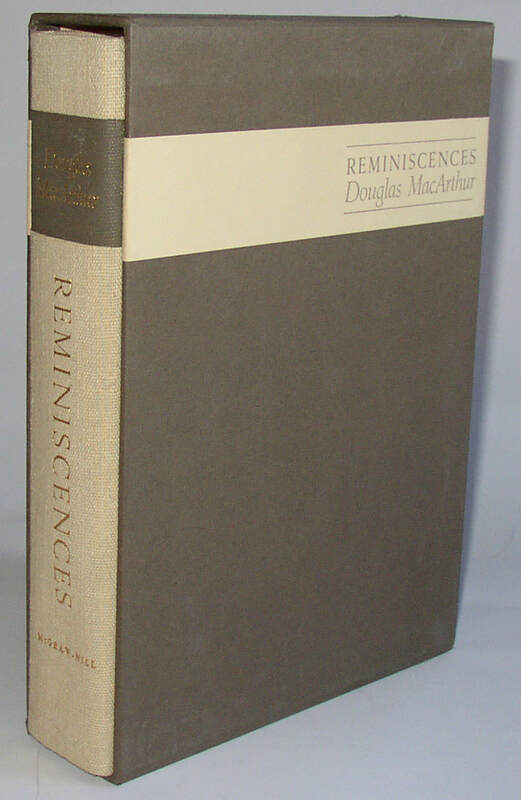 Douglas MacArthur, Reminiscences, signed 1st edition, one of 1750 copies. New York: McGraw hill, 1964. Number 601 of 1750 copies signed by MacArthur; collectible book by this historically important General of the Army. New York: British Book Centre. With a very fine two-page manuscript inscription from the author to “Oscar and Florenz,” presumably Oscar and Florenz Baradinsky, proprietors of the Alicat Bookshop in Yonkers, NY. A wonderful inscription. Condition: Book is Near Fine, jacket has some wear and tear and is between Good and Very Good. 372. 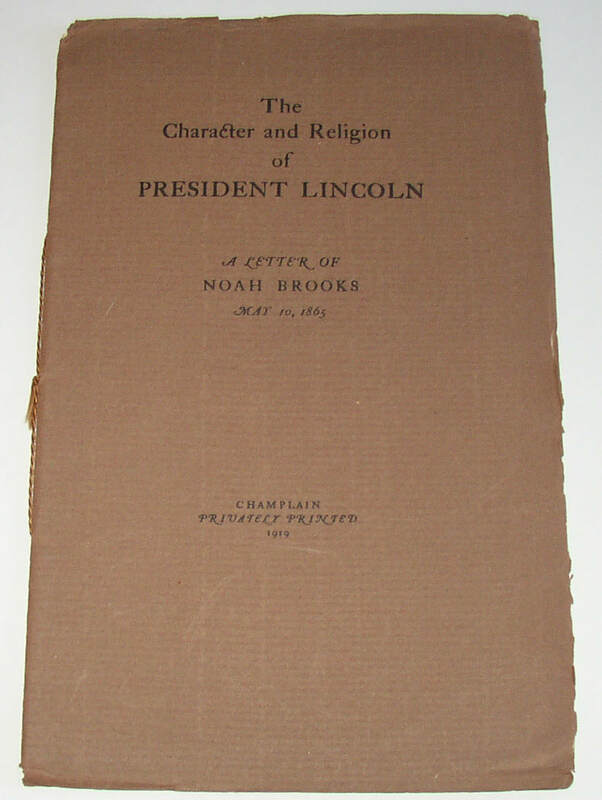 Noah Brooks, The Character and Religion of President Lincoln, Privately Printed 1919. Number 28 of only 63 copies printed in Champlain, New York, in 1919. A very scarce item of Lincolniana. Brooks is also known today for writing two of the earliest novels about the game of baseball. Of the sixty-three copies, OCLC appears to locate 18 in institutional collections. Condition: wraps showing some bends and wear and chipping where they extend beyond the text-block. Perhaps Very Good minus, on that account. One corner bump. 373. 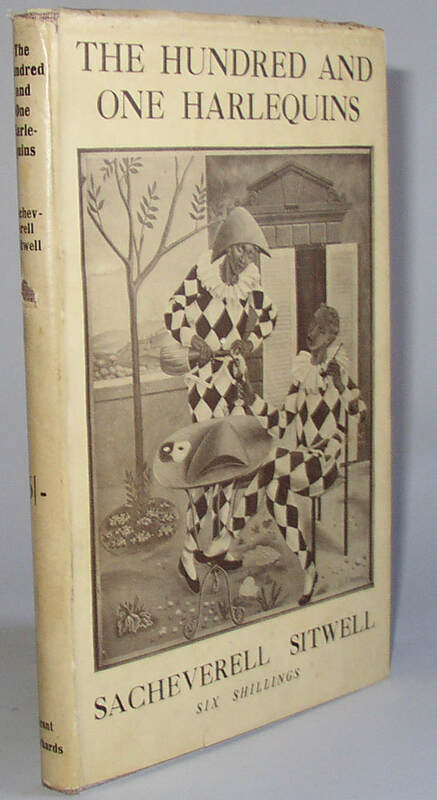 Sacheverell Sitwell, The Hundred and One Harlequins, 1st edition, signed and inscribed for the publisher. London: Grant Richards, 1922. Complete with original dust jacket. 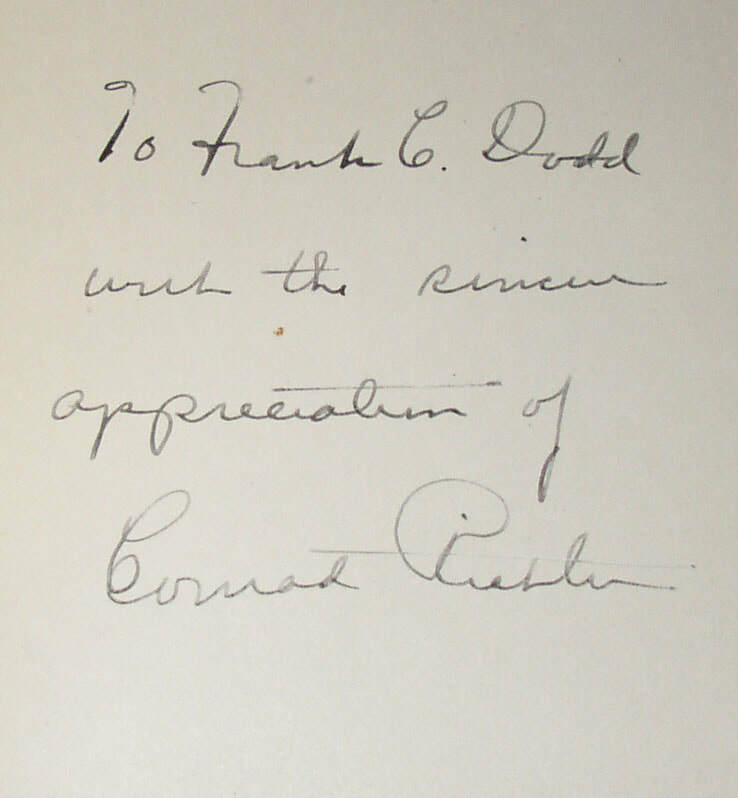 This copy signed and warmly inscribed for the publisher on July 14, 1922. An even warmer letter of the same date to the publisher has been tipped to the front board. 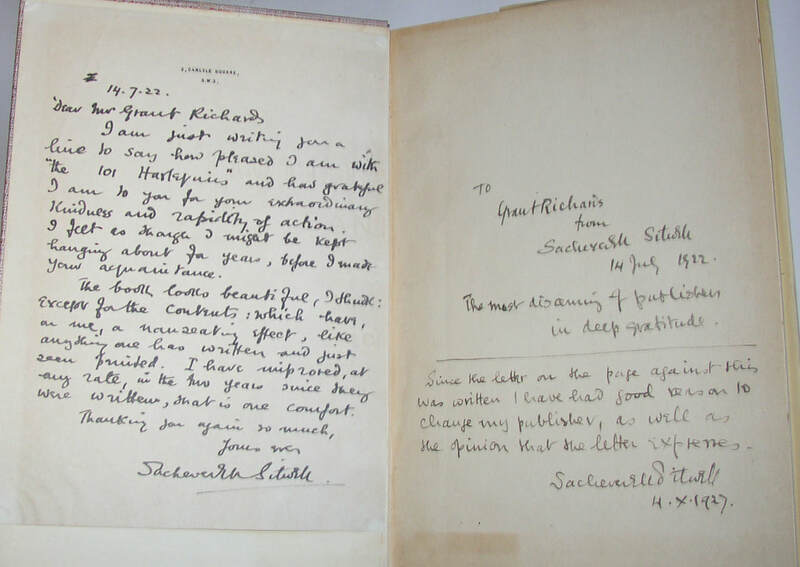 A subsequent inscription by Sitwell, dated in 1927 reads “Since the letter on the page against this was written I have had good reason to change my publisher, as well as the opinion that the letter expresses.” A remarkable copy, given the content of the three inscriptions! 374. 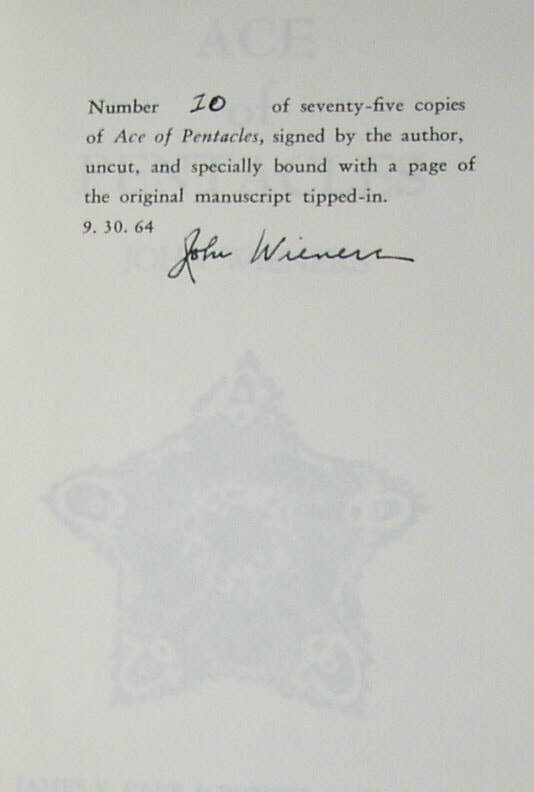 John Wieners, Ace of Pentacles, signed limited hardcover edition. New York: James F Carr and Robert A Wilson, 1964. Number 10 of 75 copies bound in boards, and with a page of Wieners’s manuscript for the book bound in. Very scarce, as such. 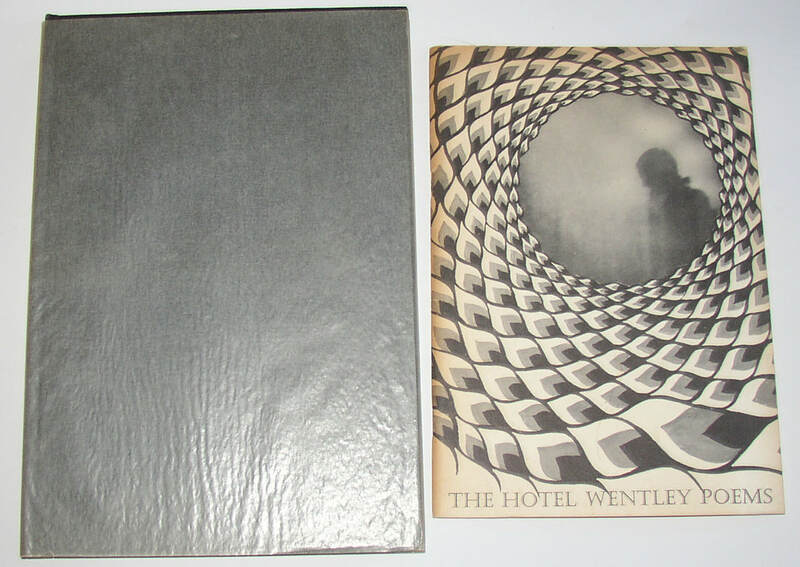 With a copy of the second edition (1965) of Wieners’s Hotel Wentley Poems. Condition: Ace of Pentacles is Fine in a Near Fine example of the unprinted glassine jacket. Hotel Wentley is near VG, with some tanning to the paper. New Haven: Wenning, 1966. Numbers 25 and 149 of a total of 218 copies; number 149 with some yellowish staining to the signature leaf and the following leaf, possibly happening when the brown wash was applied over Everson’s signature. Interestingly these two copies have different patterned paper on the boards, and different legends on the leather spines; one with Everson’s full name, and one with only his last name. These two stand as evidence of alternative states of the edition, then. Condition: Fine, except for yellowing staining on one copy, as noted, and possibly as made. 376. 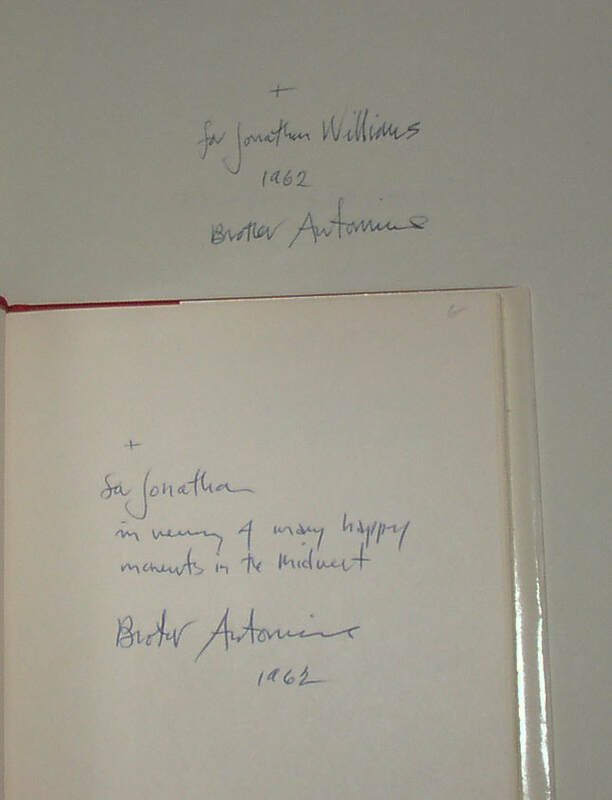 Two scarce William Everson books , signed and inscribed for Jonathan Williams. 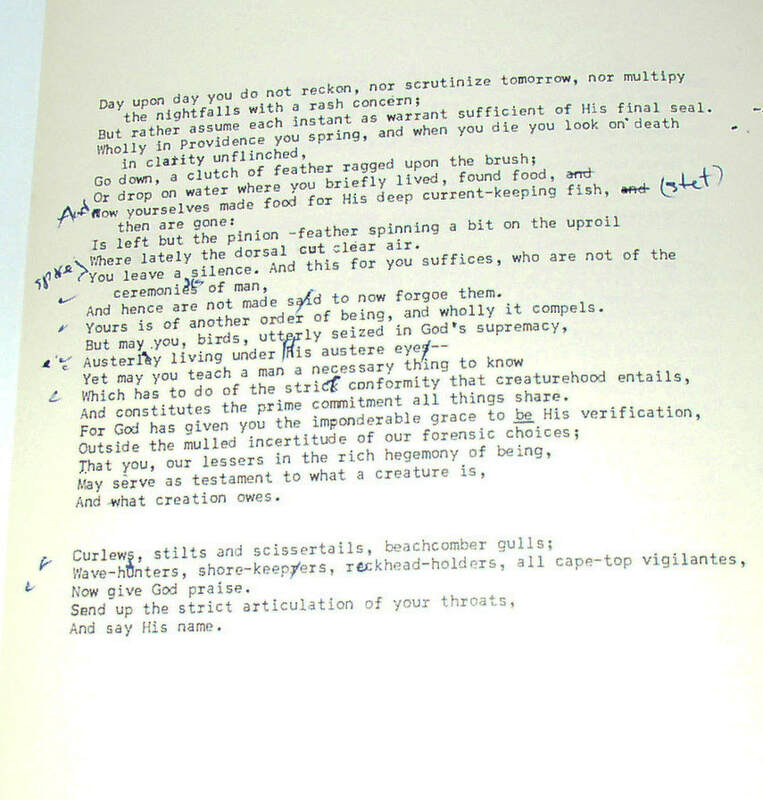 The Years Declension (Berkeley, 1961); one of 100 copies, signed on the colophon page by Everson; also inscribed on the front free end-paper, “ +/ for Jonathan Williams/ 1962/ Brother Antoninus”; in addition, Everson has written “Poems 1948 below the title of the book on the half-title page. 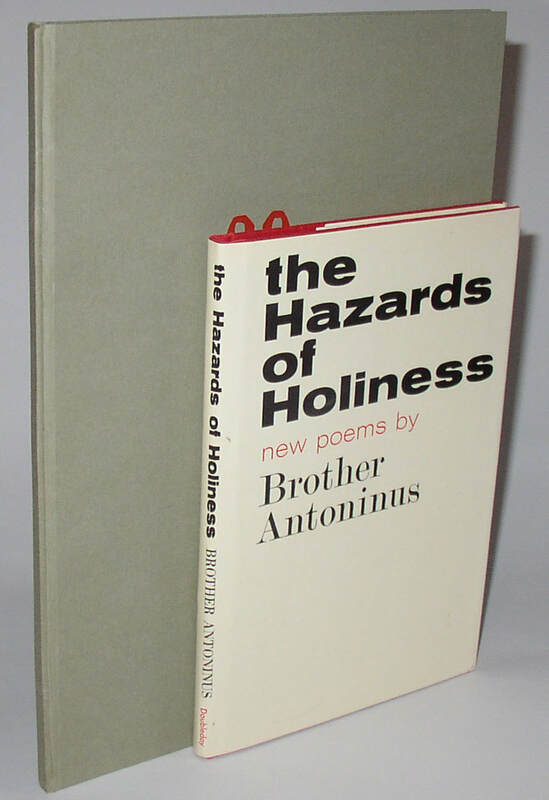 And: The Hazards of Holiness (Doubleday, 1962; First Edition stated), inscribed on the front free end-paper “”+/ for Jonathan/ in memory of many happy/ moments in the Midwest/ Brother Antoninus/ 1962.” It seems likely that both books have been inscribed for the well known poet and publisher Jonathan Williams; a fine association. Condition: Both books are close to Fine. There is a small droplet spot on the inscription page of Hazards. 377. 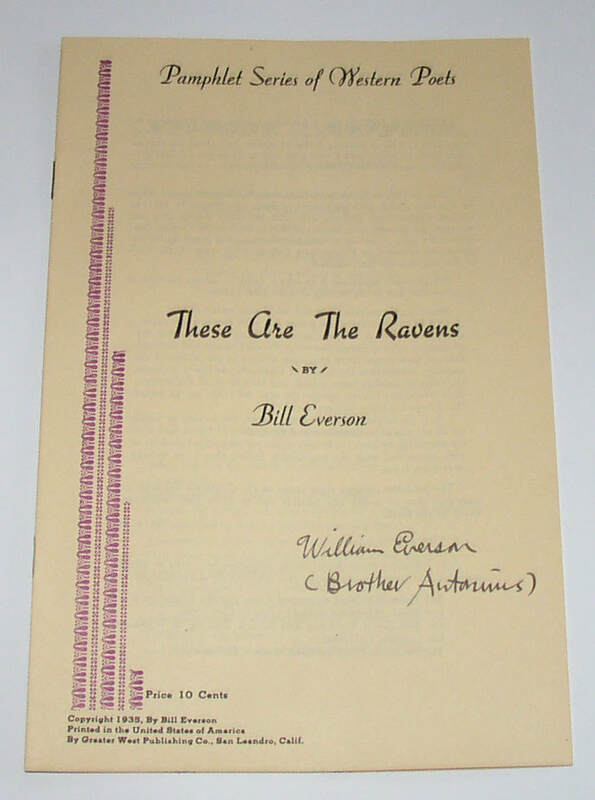 Bill (William) Everson, These are the Ravens, rare 1st edition, signed by Everson. San Leandro: Greater West Publishing Co/Pamphlet Series of Western Poets, 1935. 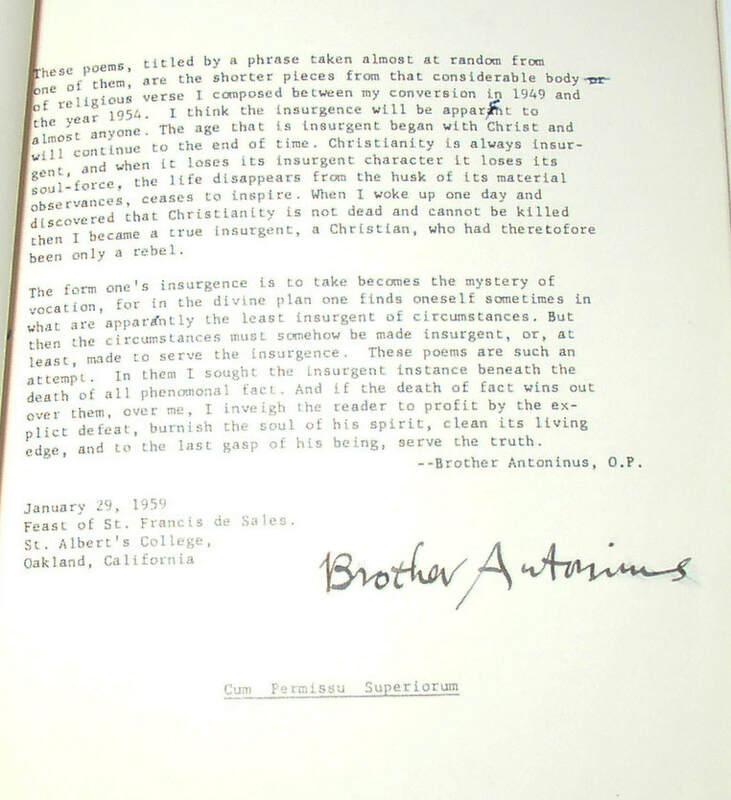 Signed on the front wrap, presumably in the 1960s, as “William Everson/ (Brother Antoninus)”. His scarce first book, published in an edition of 1000 copies, apparently. 378. 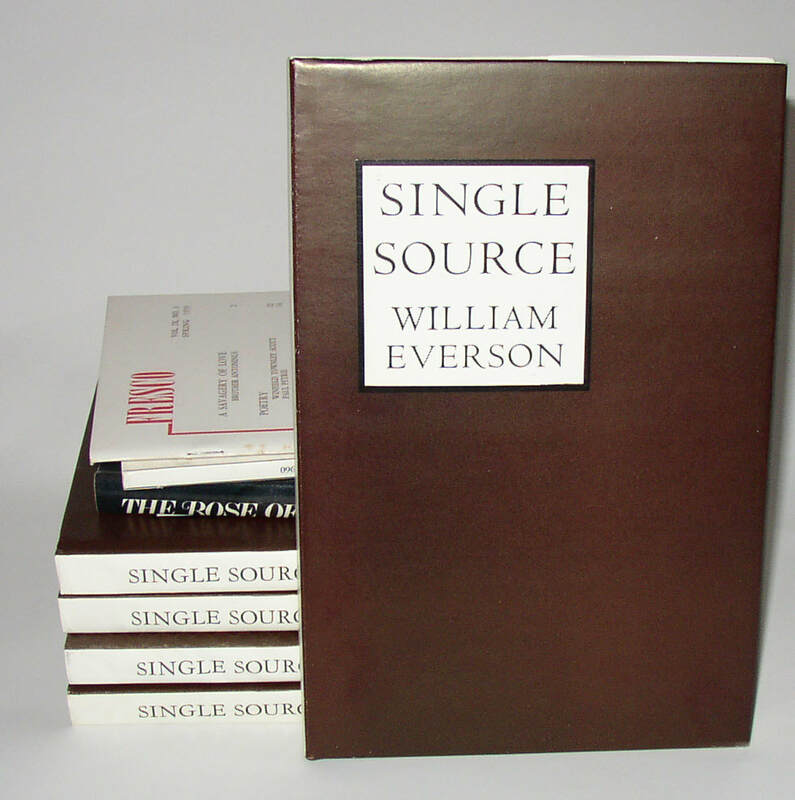 William Everson, Single Source, rare signed limited 1st edition, 1 of 25 copies. Berkeley: Oyez, 1966. 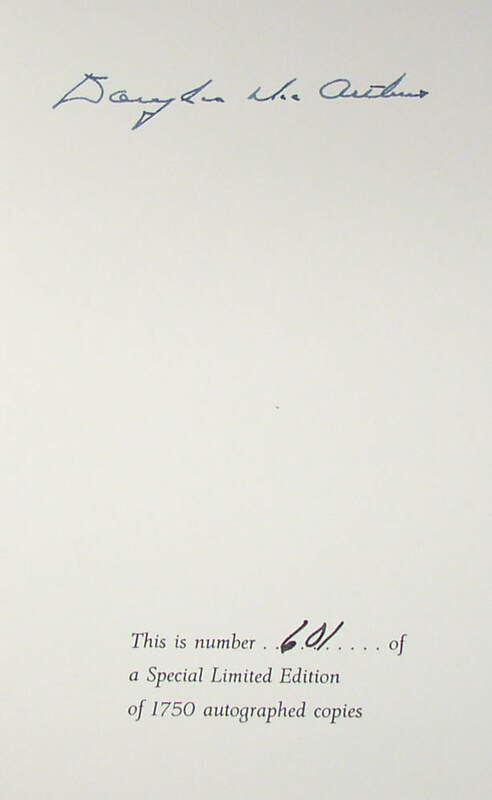 Number five of only 25 copies, bound by hand, and signed on the limitation page by Everson. Scarce and highly collectible. In original dust jacket, and with prospectus laid in. This lot also includes four copies of the same book (each with some liquid damage affecting dj and covers) showing three different states of the language/langauge correction; also a copy of The Rose of Solitude (also with similar damage) to the jacket/covers), and two journals, Fresco 9, no 3 and 10, no. 3 with Antoninus poems. Condition: Limited Edition about Fine/Fine; other books Good minus. 379. 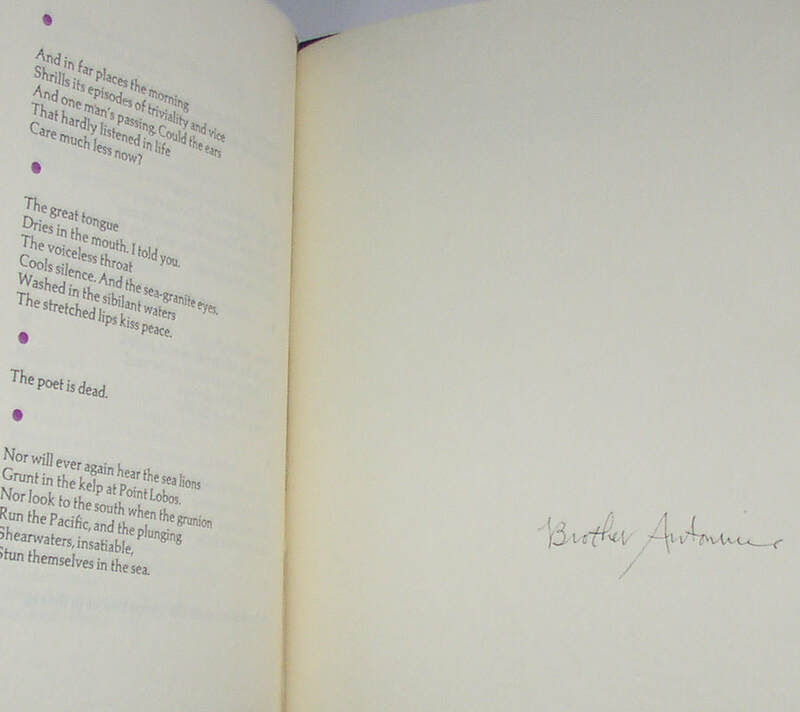 Brother Antoninus (William Everson), The Poet Is Dead, signed 1st edition, one of 205 copies. Auerhahn Press, 1964. Signed at the end by Borther Antoninus. First edition in original plain paper dust jacket; original prospectus (and mailing envelope for prospectus) laid in. Condition: Jacket shows some discoloration from proximity to leather spine; otherwise, about Fine/Fine. 380. 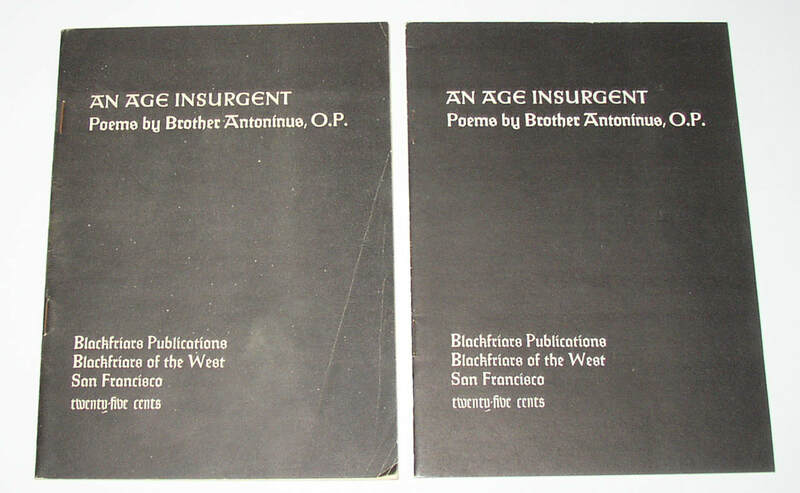 Brother Antoninus (William Everson) An Age Insurgent; 2 copies, one signed and corrected by author. San Francisco: Blackfriars, 1959. Everson’s scarcest book, evidently planned to be issued in an edition of 500 copies, but with an actual issue of less than 100 copies. One of these copies has been signed by Everson, and thoroughly corrected by him; his note on the inside rear cover says “corrected by the Author March 11 1963”: Everson has corrected typos or made other changes at more than 60 points in the text. An envelope accompanying this book states that it is “1 of 3 copies corrected by the author.” Two very rare books by this poet, one of them being especially important. 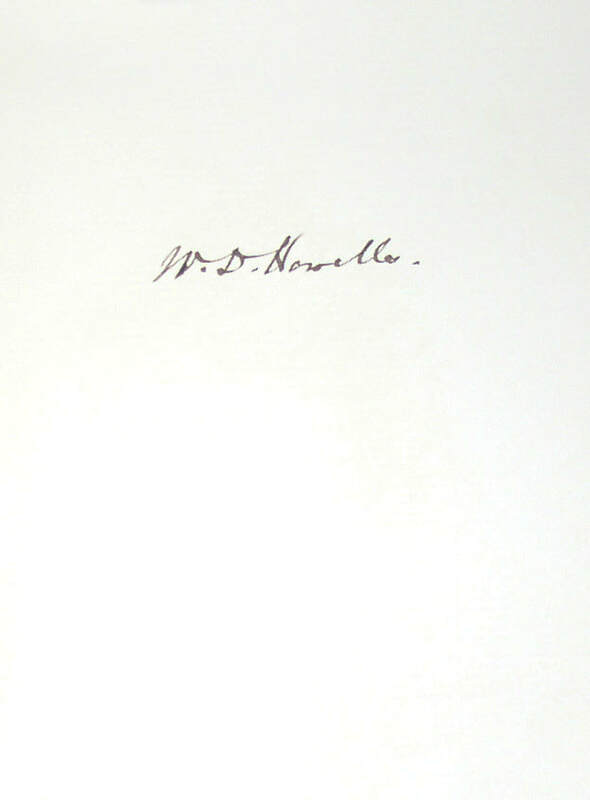 Condition: Signed and corrected copy about Good, with folds on front cover and wear. Other copy near Fine. 381. 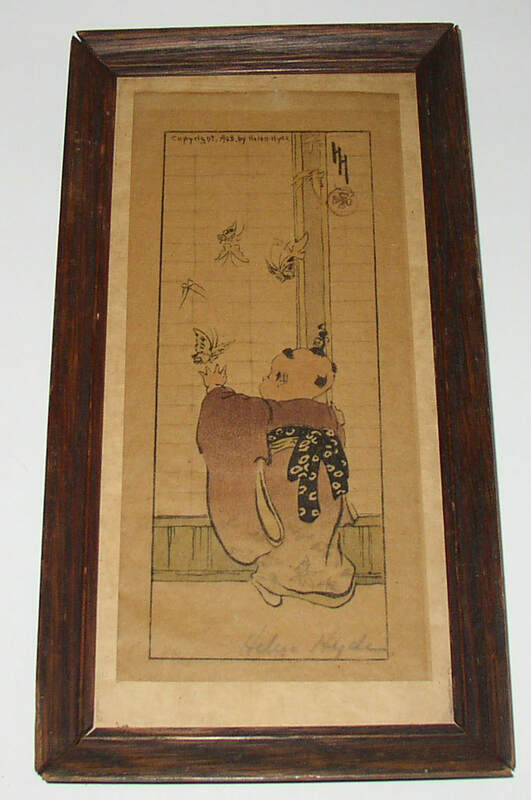 Signed print by Helen Hyde, dated 1908. Image size about 3” by 7”, showing a small child reaching towards some butterflies, all in an oriental mode. Signed in pencil at the bottom. Condition: in an old and weak wooden glazed frame, with some toning to the paper and image. 382. 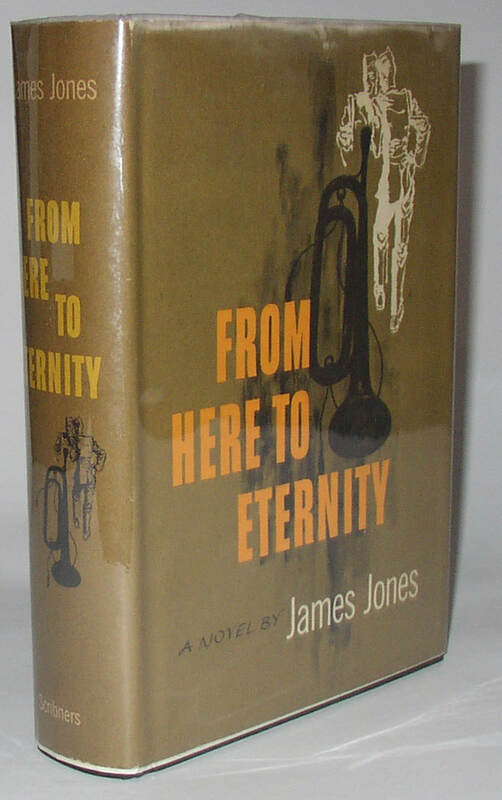 James Jones, From Here to Eternity, US 1st edition in dust jacket. New York: Scribner’s, 1951. 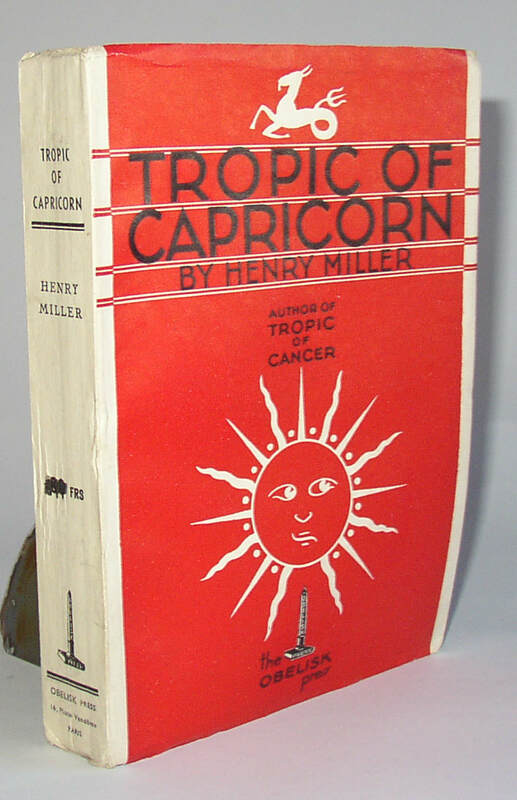 First edition, first printing with both the Scribner’s seal and the letter A on the copyright page. Dust jacket has the $4.50 price present, and the rear panel shows a photo of the author, and no reviews. Collectible an hard to find in the first state. Condition: Some fading to the gilding of the spine; jacket looks a little faded, too, but is complete, with only a couple of bumps here and there. 383. 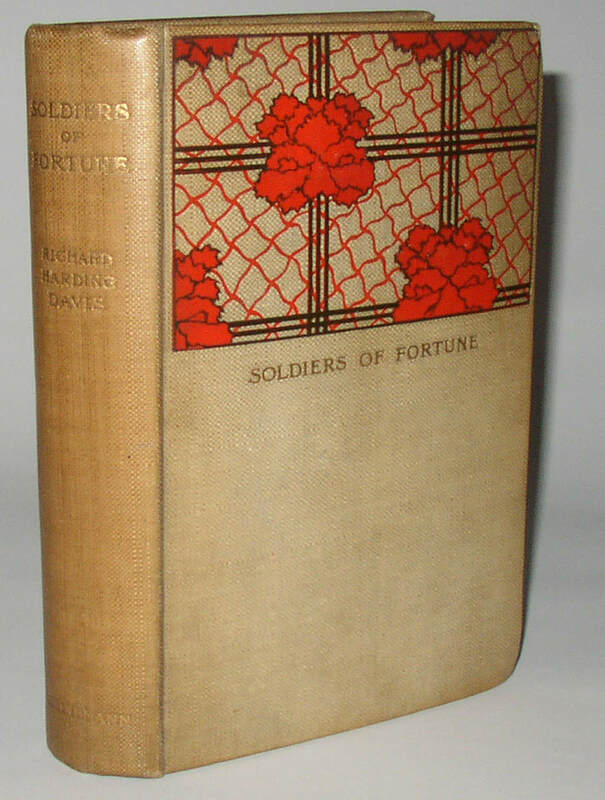 Richard Harding Davis, Soldier of Fortune, limited edition, 1 of 12 copies, signed. London: William Heinemann, 1897. 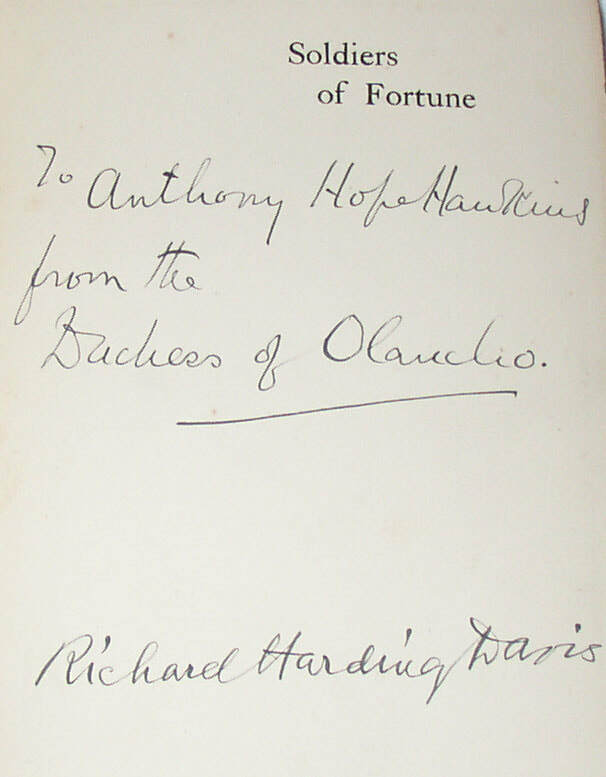 Number 4 of only 12 copies; this one signed and inscribed on the half-title page to Anthony Hope Hawkins, best known today as the author of The Prisoner of Zenda. A great association. Condition: Book has a good bit of spine roll; otherwise VG. 384. 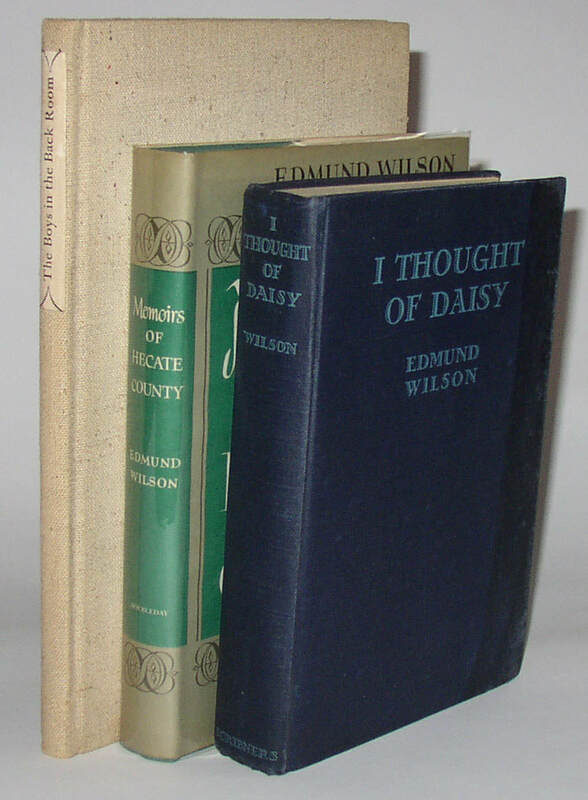 Three Edmund Wilson 1st editions, 2 signed, including The Boys in the Back Room. The Boys in the Back Room (SF: Colt Press, 1941. Number 40 of a limited edition of 100 copies. With a small non-authorial gift inscription on the front paste-down; tape ghosts on the free end-papers suggest a protective jacket was once present, taped in place, but the tape has caused minor staining. 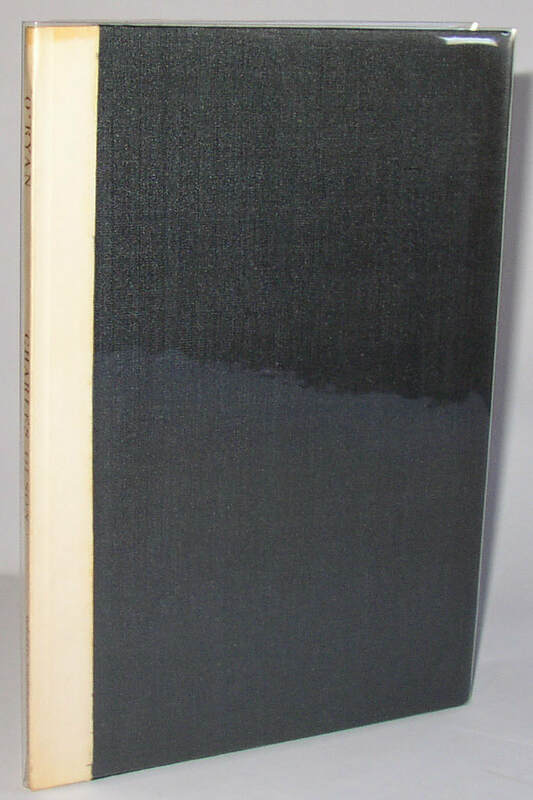 I Thought of Daisy (Scribner’s 1929); signed and inscribed on the front free end-paper and dated in 1944; water damage to the fore-edge of both boards and somewhat affecting the interior. Memoirs of Hecate County; unsigned but in close to As New condition. 385. 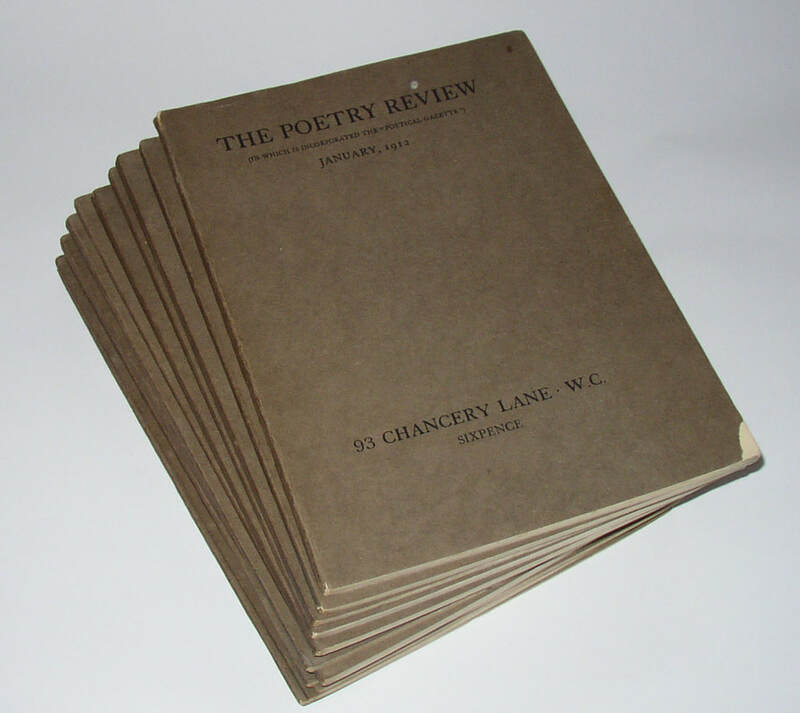 The Poetry Review, 12 issues, from January 1912 to December 1912. Includes poems by figures such as Ezra Pound, Rupert Brooke, John Drinkwater, and William Carlos Williams; in the case of Williams, these poems stand as his first appearance in any poetry journal. An important pre-WWI poetry journal. These copies are individual volumes, not a bound volume. Condition: Near Very Good, with occasional chips or stains. 386. 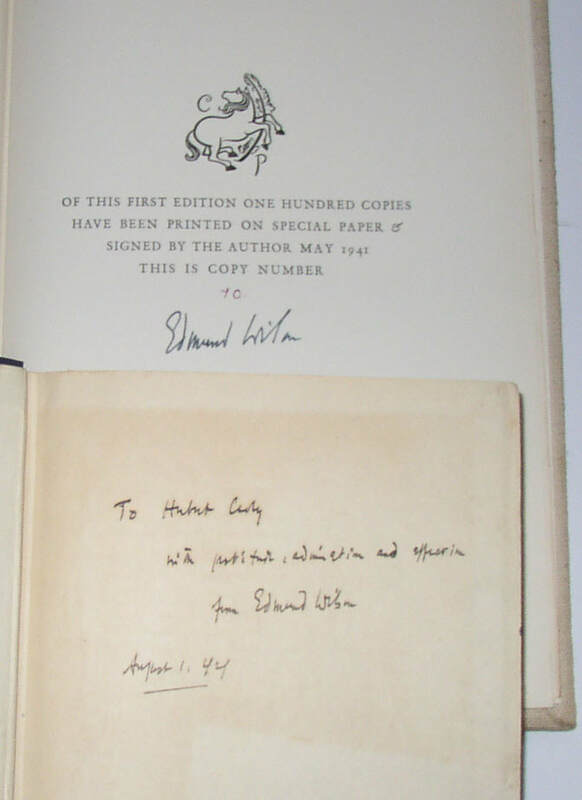 Two William Dean Howells 1st editions, 1 signed and limited. Includes: Literary Friends and Acquaintance, signed limited first edition. Number 50 of 150 copies making up the Autograph Edition. 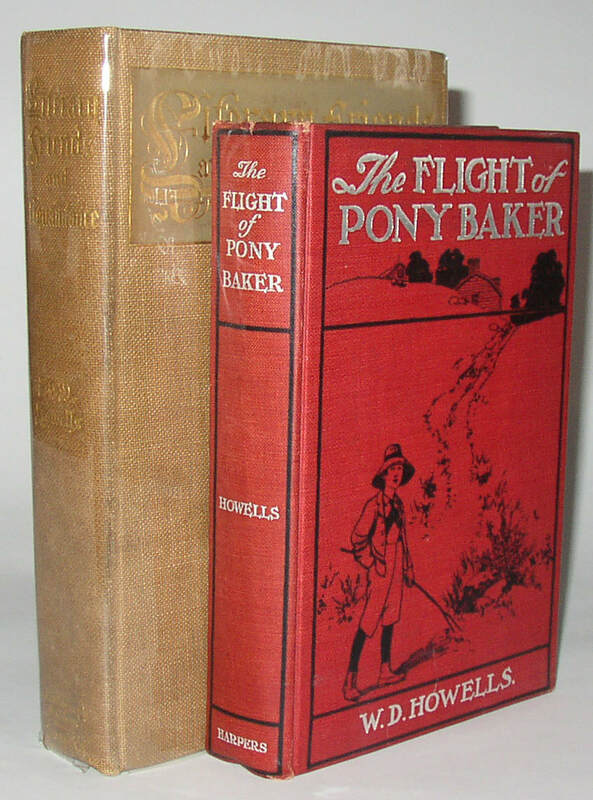 Also, The Flight of Pony Baker (Harpers, 1902), first edition in red cloth boards. Condition: Literary Friends and Acquaintance is Near Fine, with some mild bumps to the tips of the boards; Pony Baker, about Very Good or Very Good plus. Sale Estimate: $100-150.00 for both volumes. 387. 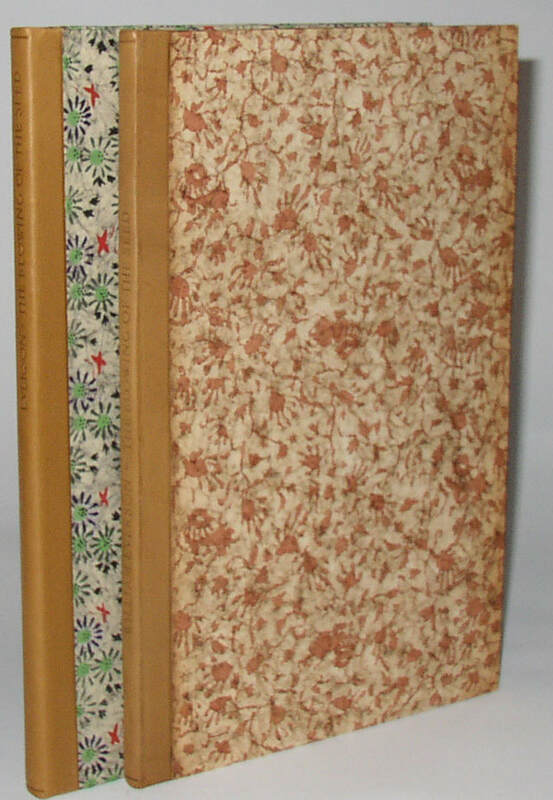 Three early books in original dust jackets: 1893 to 1900; 2 by Hamilton Mabie. 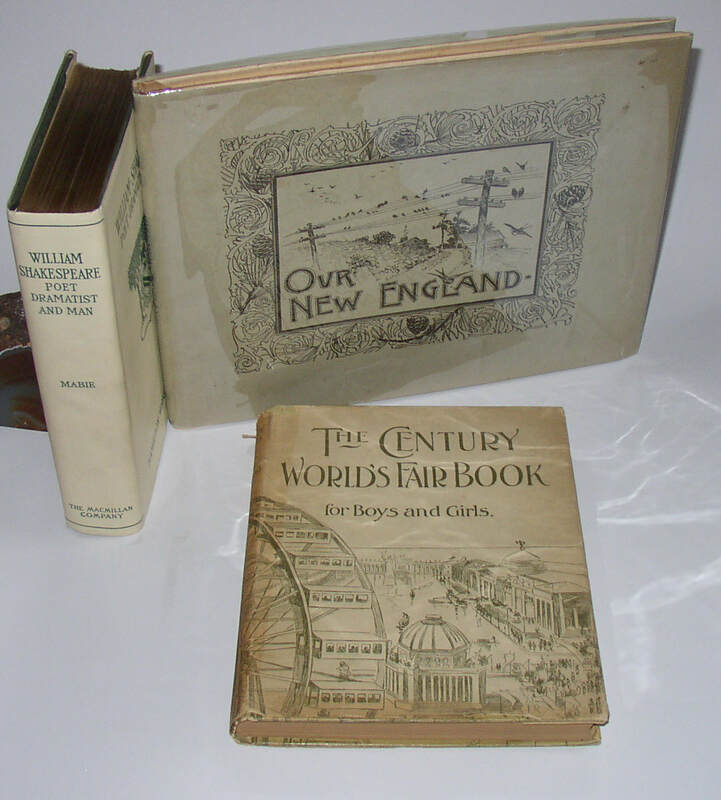 Includes: The Century World’s Fair Book for Boys and Girls (Century, 1893); no indication of later printing. Complete with pictorial paper dust jacket showing a panoramic view of the fair, including the famous Ferris Wheel. And, Hamilton W Mabie, Our New England (Boston: Roberts Brothers, 1890); first edition, illustrated by photogravures; complete with paper dust jacket with illustration on the front panel. And Hamilton W Mabie, William Shakespeare: Poet Dramatist & Man (New York: Macmillan, 1900). First edition in green suede, with printed linen dust jacket. Condition: Books generally close to Fine, but with gift or owner’s inscriptions inside. Paper jackets with some minor chipping, tears and loss, but essentially complete and not split. Linen jacket fro Shakespeare with some external grubbiness. 388. 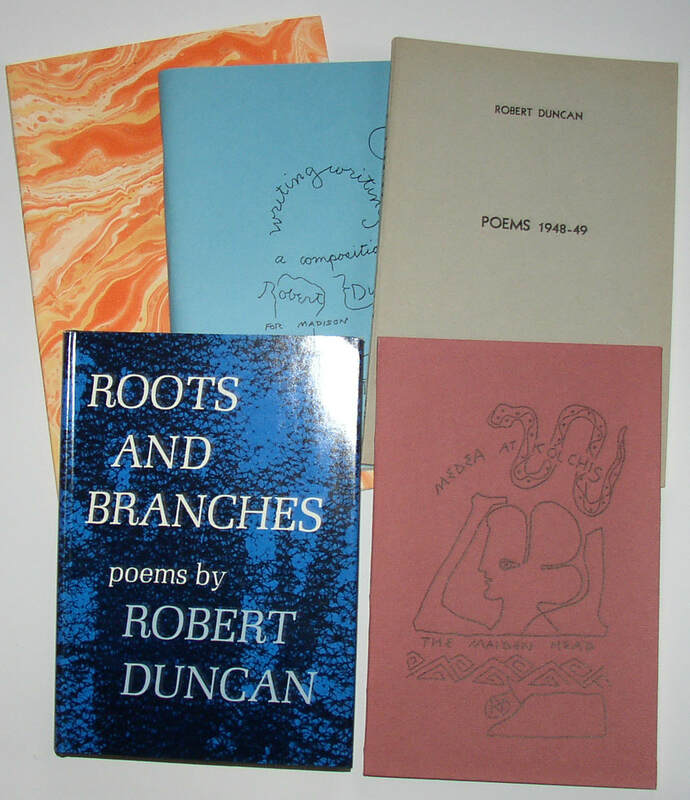 Five first edition poetry books by Robert Duncan. Includes: Roots and Branches (1964); Medea at Kolchis The Maiden Head (1965); Writing Writing A Composition Book Stein Imitations (1964; errata sheet present); Poems 1948-49 (Berkeley Miscellany Editions ); Letters (1958; Jargon 14). All beautiful and collectible copies. Condition: About Fine, in each case. 389. Dr Seuss, How the Grinch Stole Christmas!, 1st edition in dust jacket, plus Rudolph. New York: Random House, 1957. 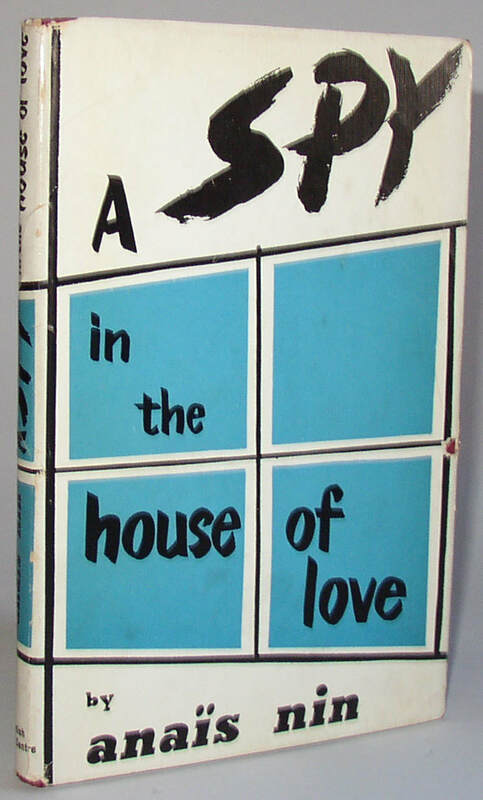 First edition, first printing, with all the relevant points, in a first state dust jacket. 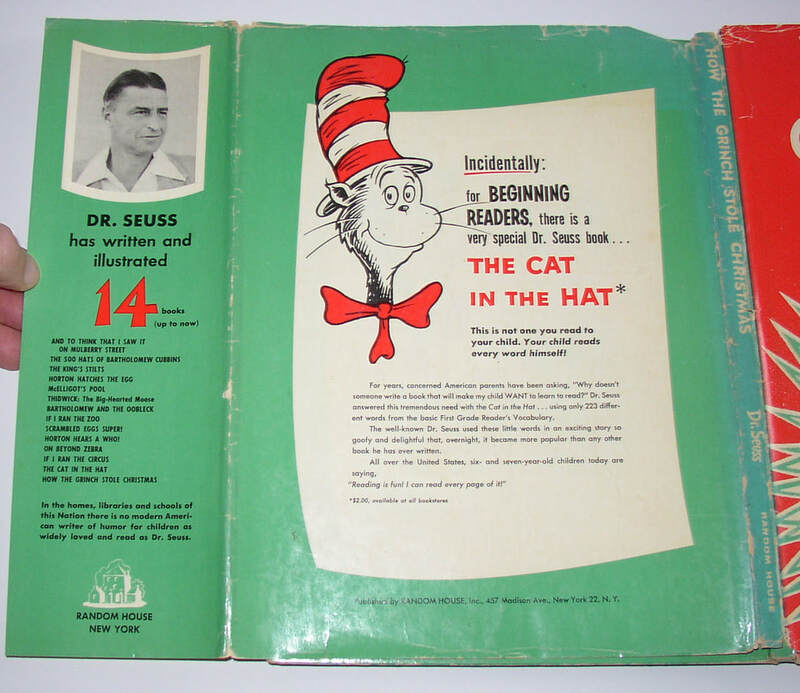 Specifically: 250/250 price code on jacket; 14 books listed on rear flap of jacket; Cat in the Hat listed on rear panel of jacket at $2.00; last printed page of book features 13 titles, with The Cat in the Hat listed first. A Christmas classic, scarce in the first state, as here. With: two copies of Rudolph the Red Nosed Reindeer, both softcover Montgomery Ward giveaways. One is the later state, with no elves on p. 6 and a four-motor plane on p 9; one is the first state, with elves on 6 and a tri-motor on 9. 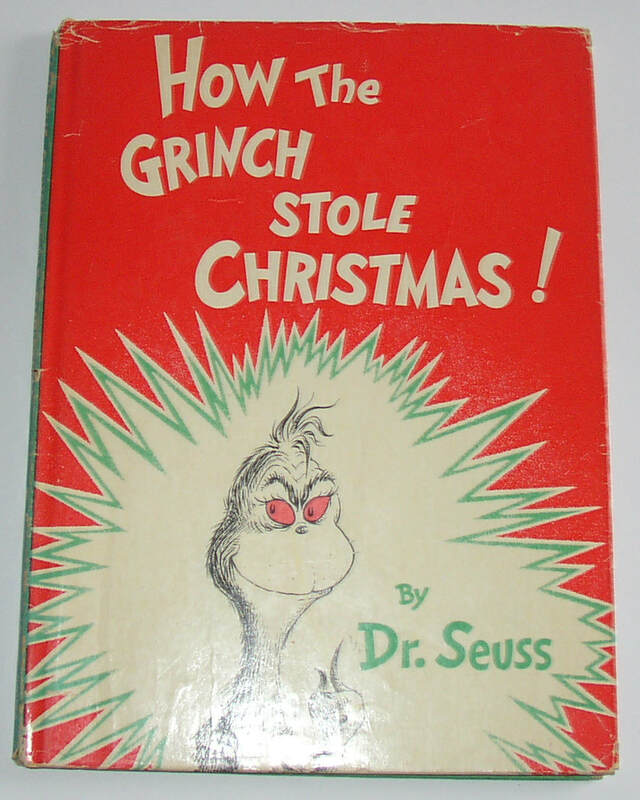 Condition: Grinch is Good to Very Good (book and jacket), with overall wear, especially around the edges. 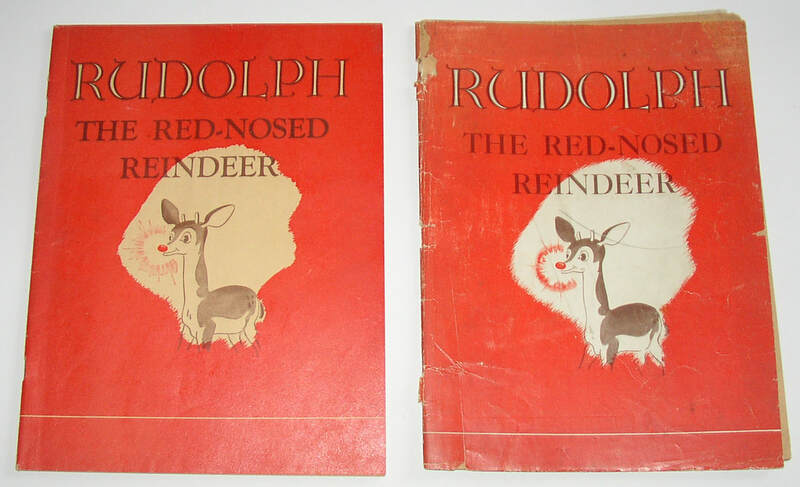 The later state of Rudolph is about Near Fine; the first state is poor, with most of the first leaf/title page roughly torn out and with heavy overall wear. New York” Brazillier, 1962. 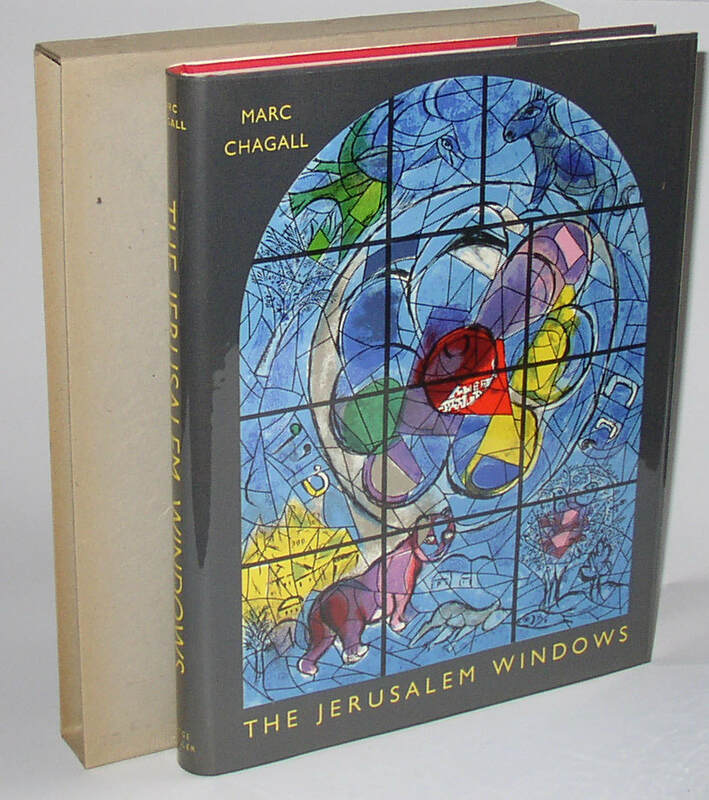 With two original Chagall lithographs bound in. 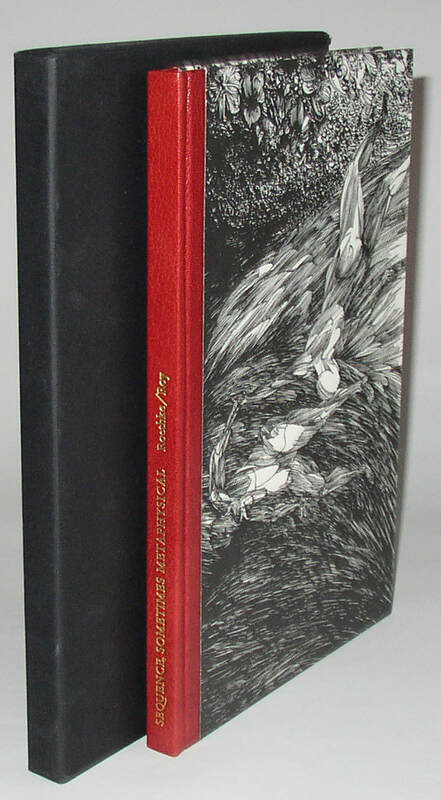 A beautiful copy that looks like it has rarely been removed from the slipcase. Both dust jacket and acetate jacket cover present and looking fine. A superior copy of a collectible book. Condition: Book, jackets, and slipcase all near Fine. 391. 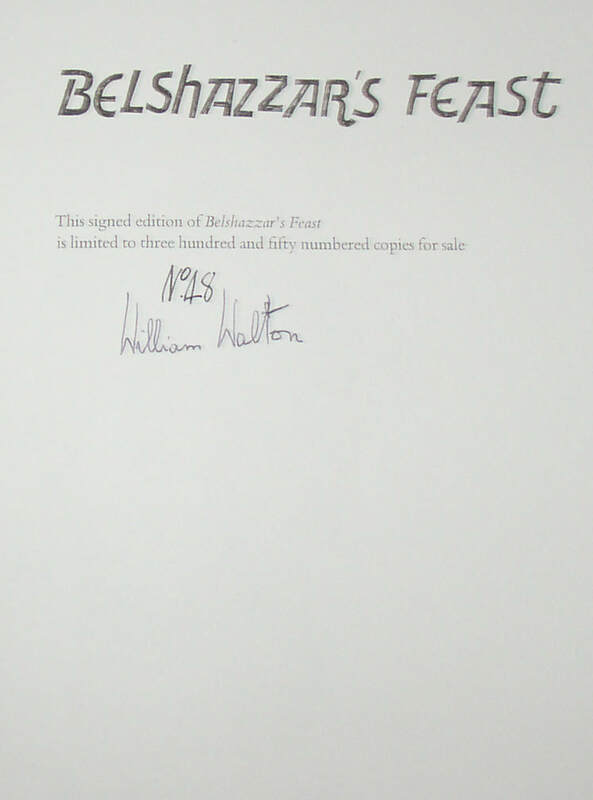 William Walton, Belshazzar’s Feast, signed limited edition (1978) in slip-case. Oxford University Press, 1978. 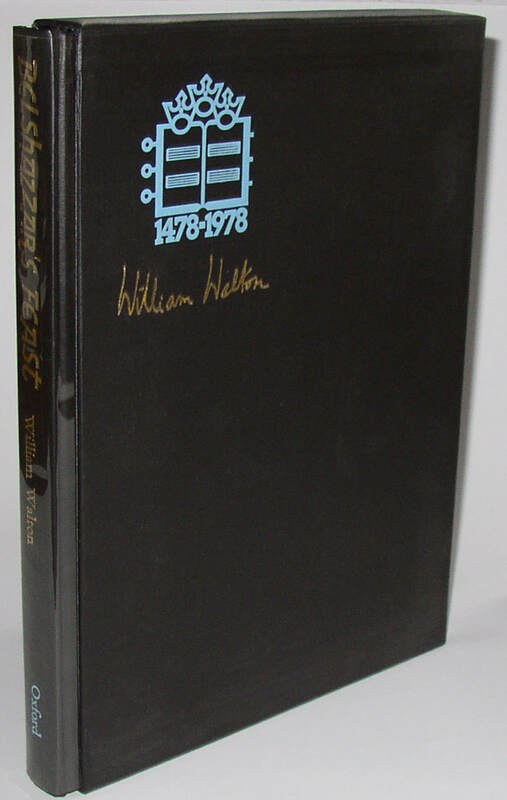 Signed on the limitation page by Walton; a classic musical score. Condition: Book, jacket, and case all in close to Fine condition. 392. 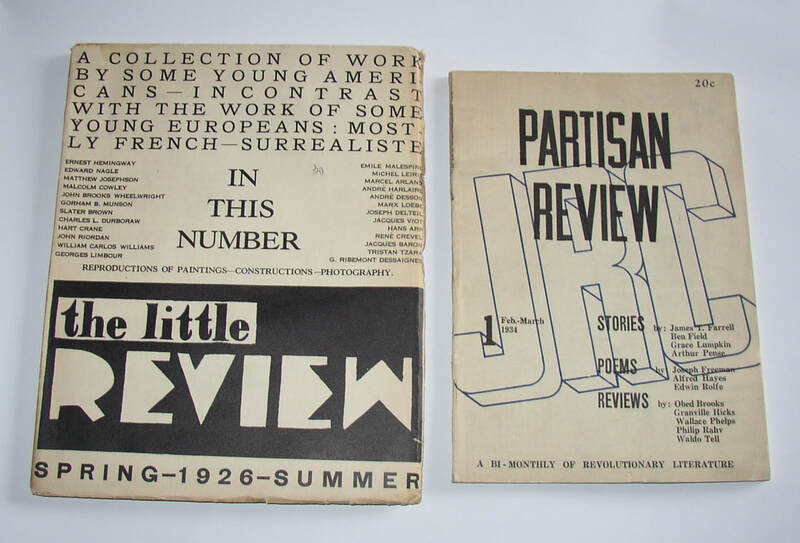 Two rare literary journals: Partisan Review issue 1 (1934); The Little Review, Spring 1926. The very first issue of The Partisan Review, which would go on to become a significant publication, and a copy of The Little Review that includes contributions from Ernest Hemingway, Malcolm Cowley, Hart Crane, William Carlos Williams, and others. Condition: Both with some darkening and wear around the edges: Good to Very Good. 393. 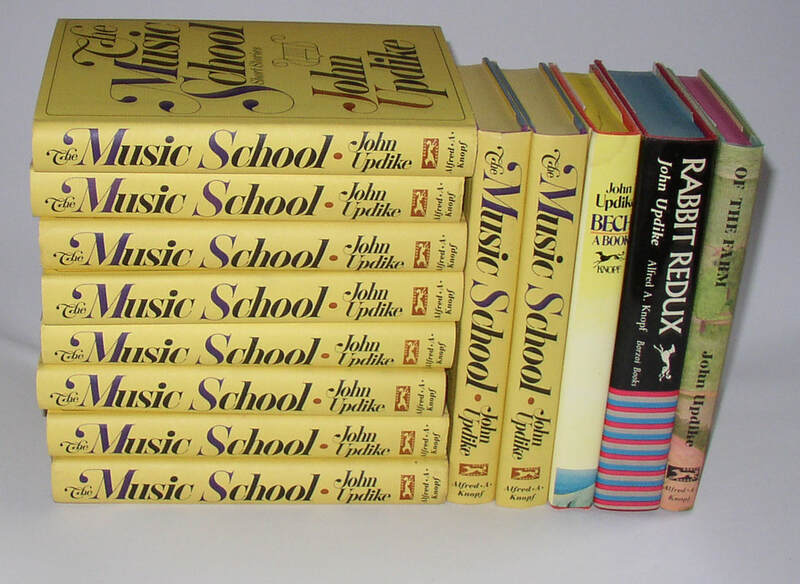 John Updike, The Music School, 1st edition, lot of 9 first state copies, plus four more Updike 1sts. New York: Knopf, 1966. Nine copies of the first state of The Music School, with the order of two of the lines in the poetic quotation on page 46 reversed; plus one copy of the corrected state (with the corrected page tipped in, rather than integral), plus first edition copies of Updike’s Of the Farm, Rabbit Redux, and Bech: A Book. The first state of The Music School is reputed to be scarce; these were presumably purchased when the book was new and well taken care of. Condition: All in about Fine/Fine condition, with some occasional shelf-soil to a jacket edge or two. A beautiful lot. 394. 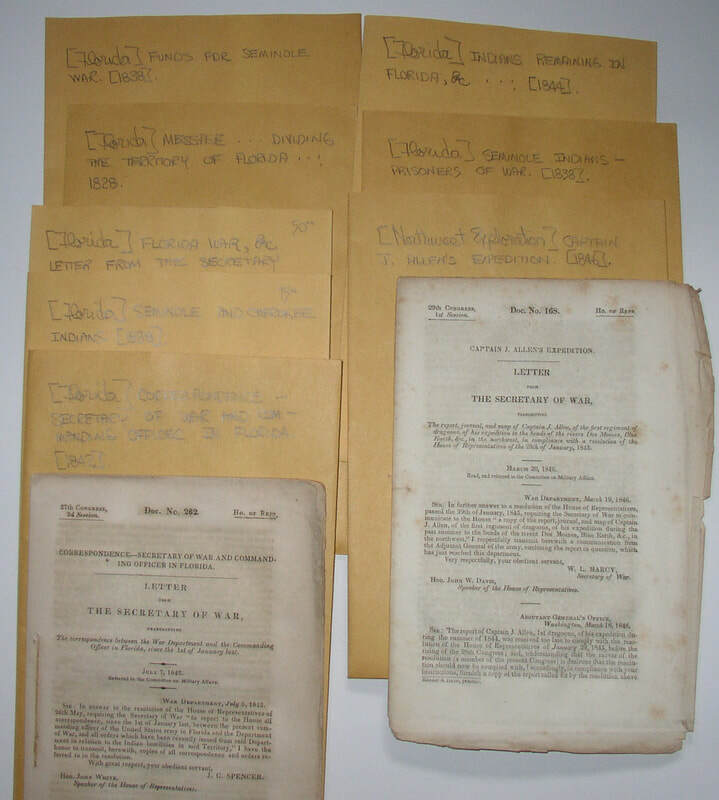 Eight congressional papers/reports, mostly dealing with Florida and Seminole Affairs, 1828-1846. Washington, 1828-1846. A lot of individual booklets documenting Congressional communications and activities, mostly dealing with Florida, Seminole, and Cherokee affairs. Remarkably, these remain string bound and generally uncut/unopened, and they appear to never have been bound into larger volumes. Unusual in this state. Condition: toned; with occasional edge tatters, but generally very solid. 395. Five 1st edition mystery novels, including P D James, Shroud for a Nightingale. 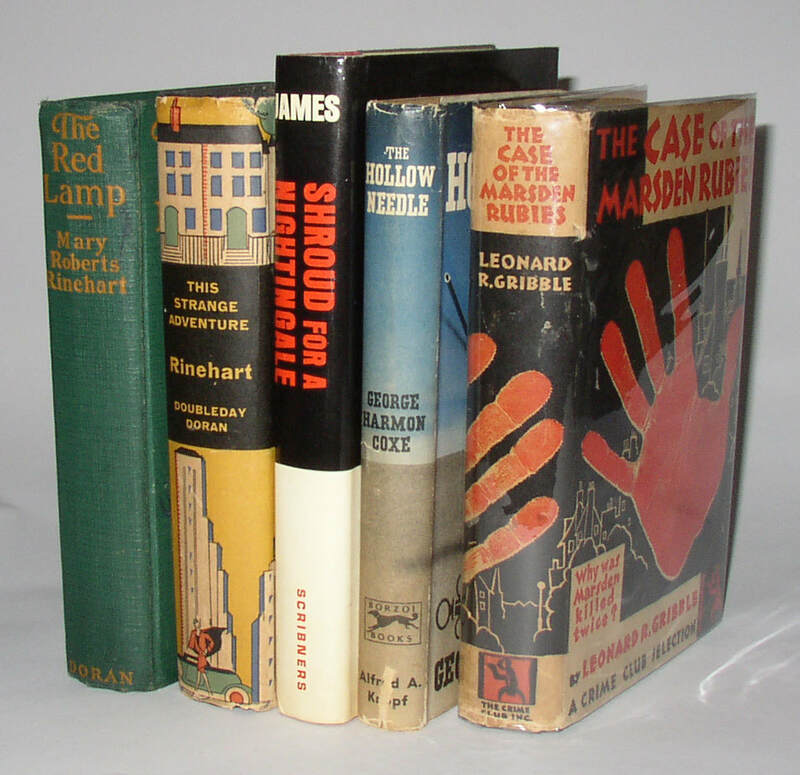 Includes: A) Mary Roberts Rinehart, The Red Lamp (Doran, 1925); no dust jacket: about VG. B) Mary Roberts Rinehart, This Strange Adventure (Doubleday Doran, 1929); 1st in dj, Near VG/VG. C) Leonard Gribble, The Case of the Marsden Rubies. First Edition stated; original jacket (Near VG/VG, with some tattering to jacket edges); D) George Harmon Coxe, The Hollow Needle, signed and inscribed 1st edition (Knopf, 1948); E) P D James, Shroud for a Nightingale (Scribners 1971). Scarce first ed in dj (NF/NF). An interesting lot. 396. 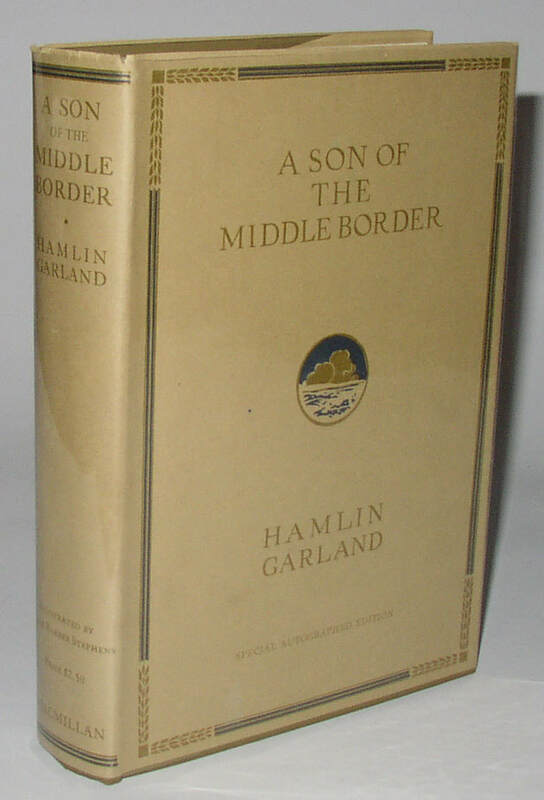 Hamlin Garland, A Son of the Middle Border, stunning autographed edition in dust jacket (1917). New York: Macmillan, 1917. 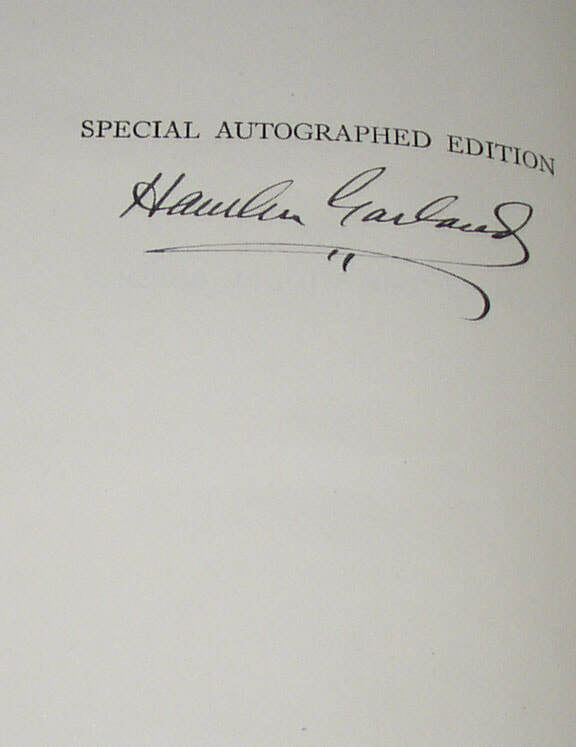 Special Autographed edition, signed on the reverse of the half-title page by Garland. A beautiful copy in a dust jacket that looks almost brand new. Very scarce indeed in dust jacket, and this example of the jacket is especially fine. Condition: Book is Near Fine; jacket the same, but with a couple short and unobtrusive closed tears, the largest (less than 1”) is at the joint between the front flap and the front panel. An amazing copy. 397. 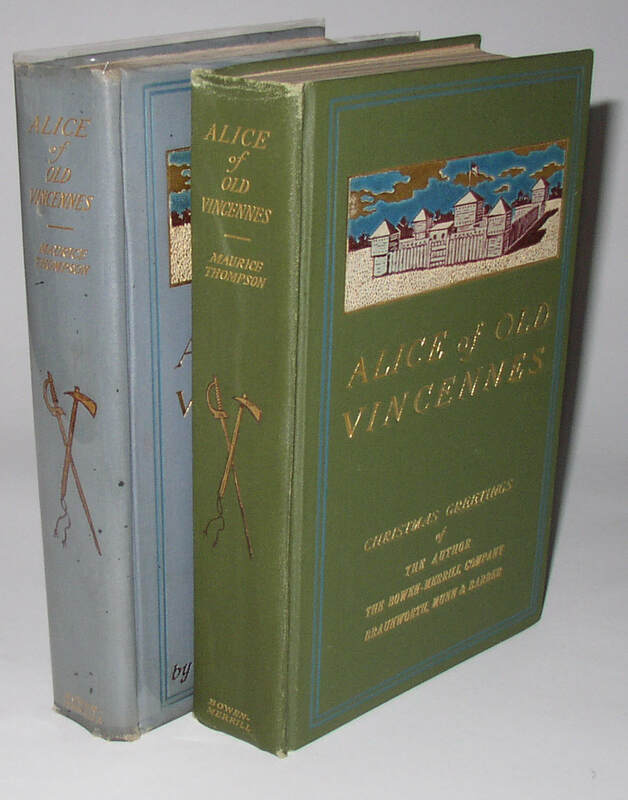 Maurice Thompson, Alice of Old Vincennes, two author’s presentation copies. Indianapolis: Bowen-Merrill, 1900. First state in blue cloth, with no acknowledgement of historical sources on p. ; green cloth with the acknowledgment. Blue cloth copy with a label on the front paste-down identifying is as a “special copy . . . sent in advance of publication . . . with the compliments of the author and publishers.” Green cloth copy with a similar plate presenting the book to E H Ayers, Esq., with the compliments of the Author, stated Christmas 1900. Great copies—the title itself is not rare, but these special copies are especially interesting. 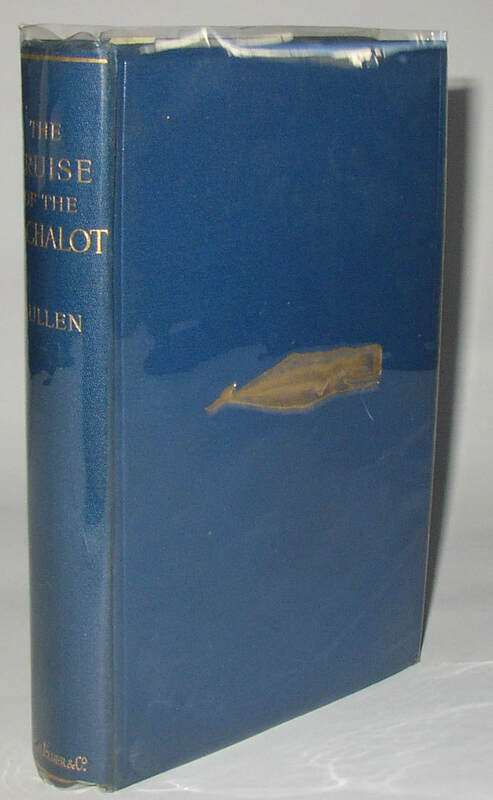 Condition: Blue cloth copy about VG, with light wear to the edges; Green cloth copy closer to Near Fine, with some wear at the top of the spine. 398. Septimus Globus/George Cruikshank, Der Freischutz, 1st London edition (1824). London: Baldwyn, 1824. 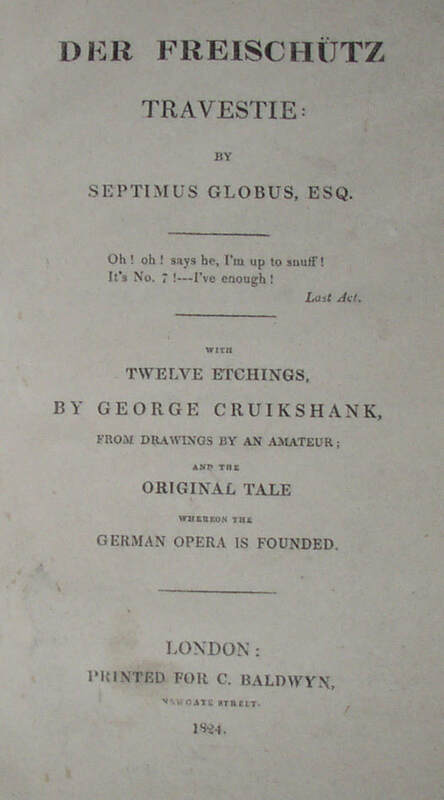 A comedic dramatic text based on a German opera,with twelve plates engraved by Cruikshank: the plates are probably the chief reason for the collectibility of the book. This copy rebound. Condition: Internally quite nice, though with an ink signature on the endpaper and on the second leaf; later half-leather binding over cloth showing a good deal of wear, but still solid. Externally Good. 399. 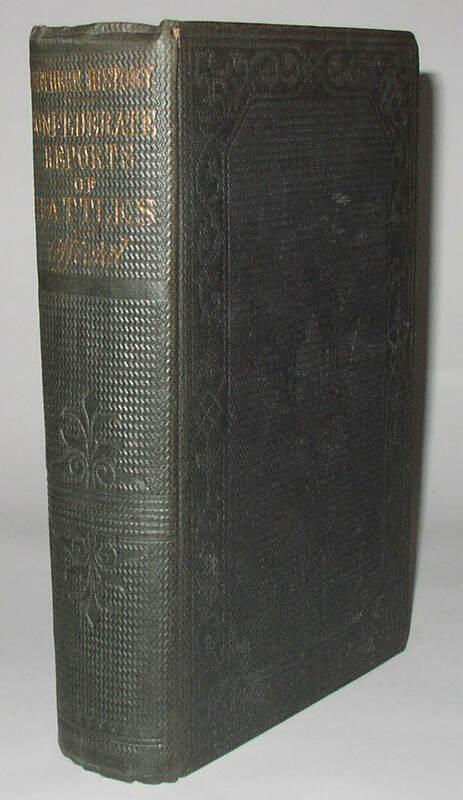 Southern History of the [Civil] War: Reports on Battles, New York Edition (1863). New York: Richardson, 1863. Apparently reprinting an 1862 Richmond VA imprint, according to the title page that follows the Richardson title. 578pp plus 2pp publisher’s catalogue leaf. An especially well preserved coy. Condition: Some bumps at tips of boards, minor bit of loss to cloth at the top of the spine, old bookseller’s pencil notes on front free end-paper. Else close to Fine in original publisher’s cloth. A true collector’s copy. 400. 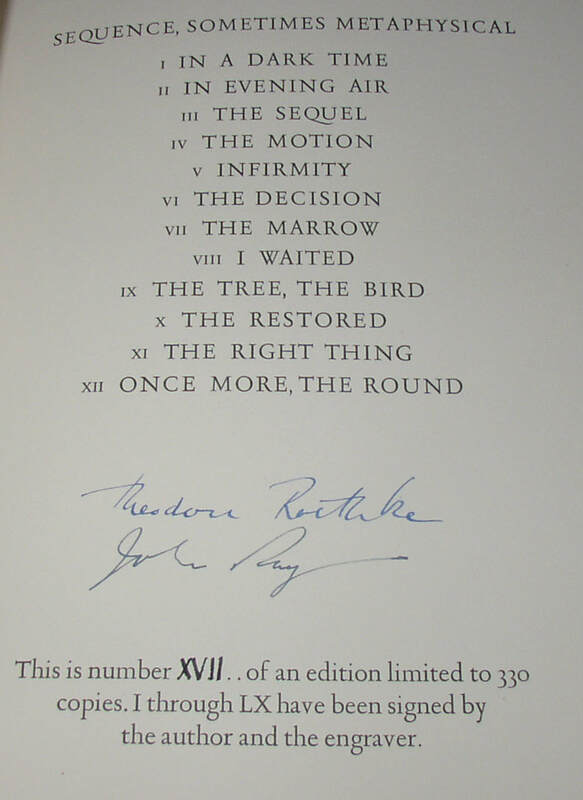 Theodore Roethke, Sequence, Sometimes Metaphysical, signed limited 1st edition, 1 of 60. Iowa City: Stone Wall Press. 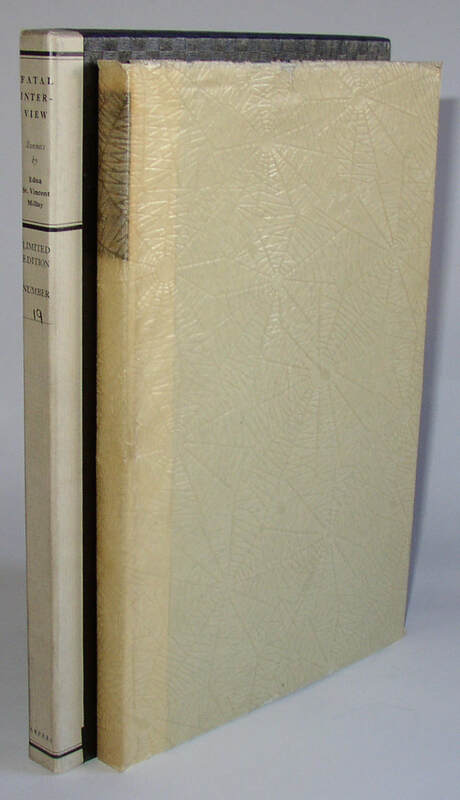 Number XVII of 60 total copies singed by Roethke and by the engraver John Roy: a beautiful copy of a rare book; scarce on the market.